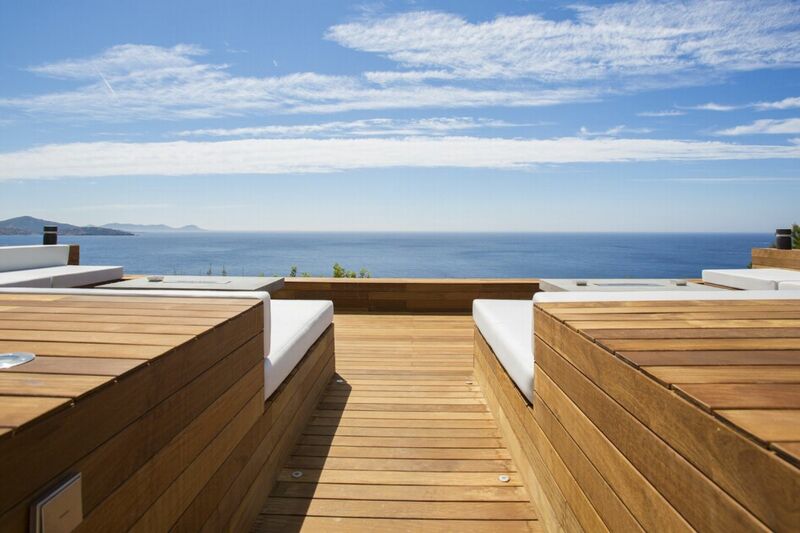 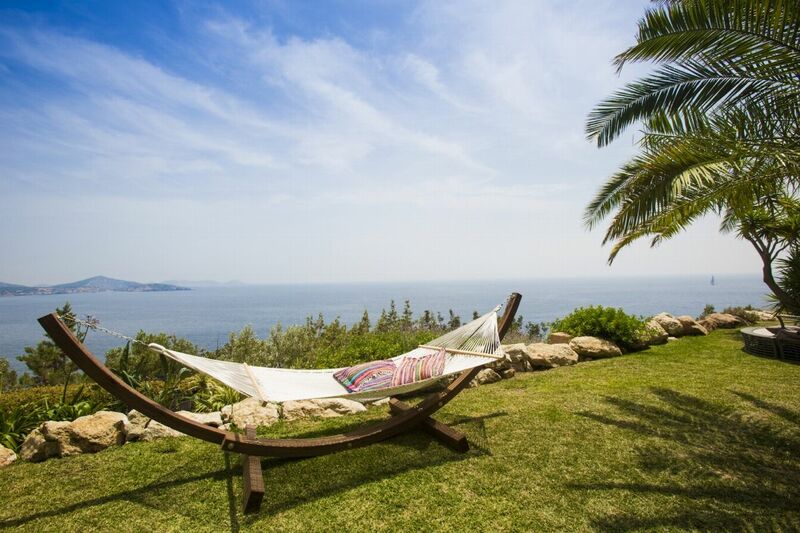 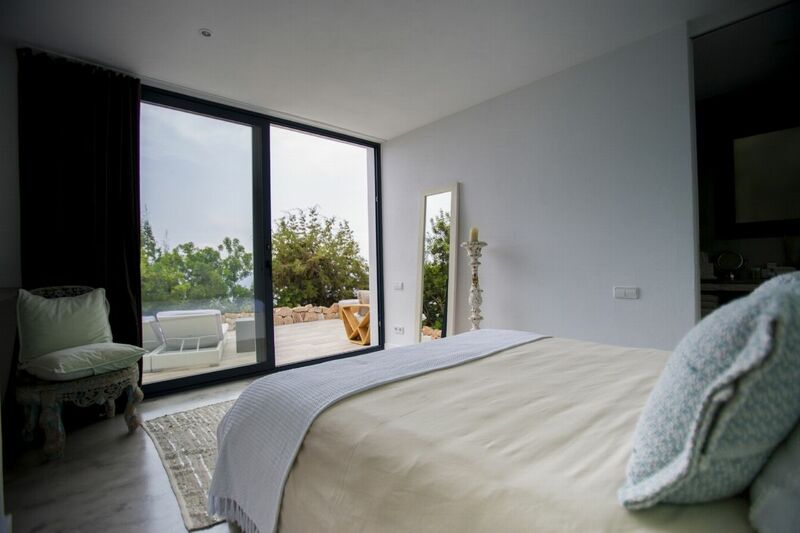 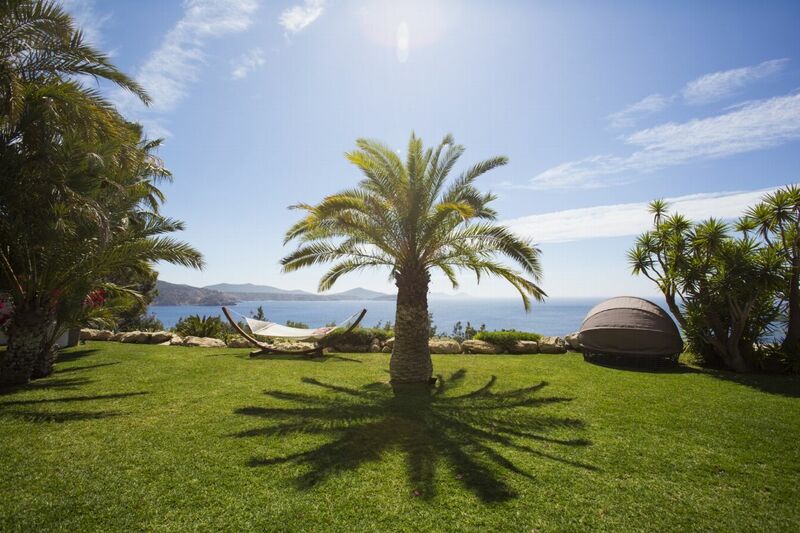 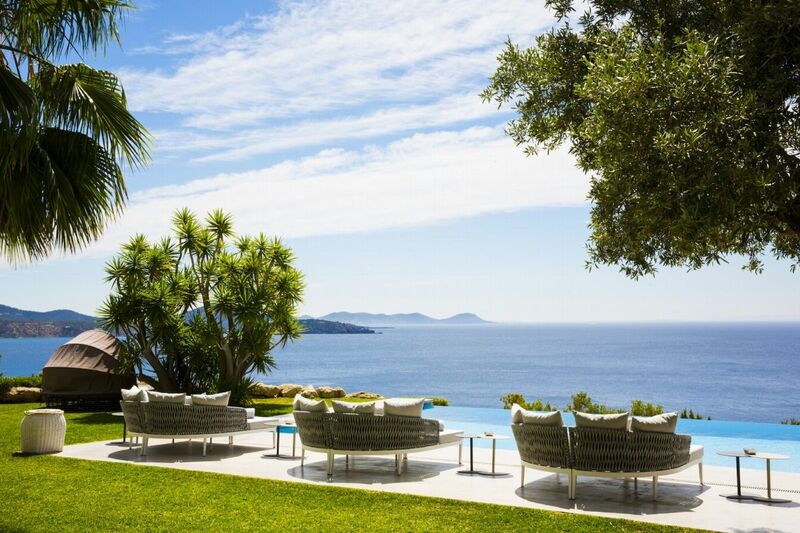 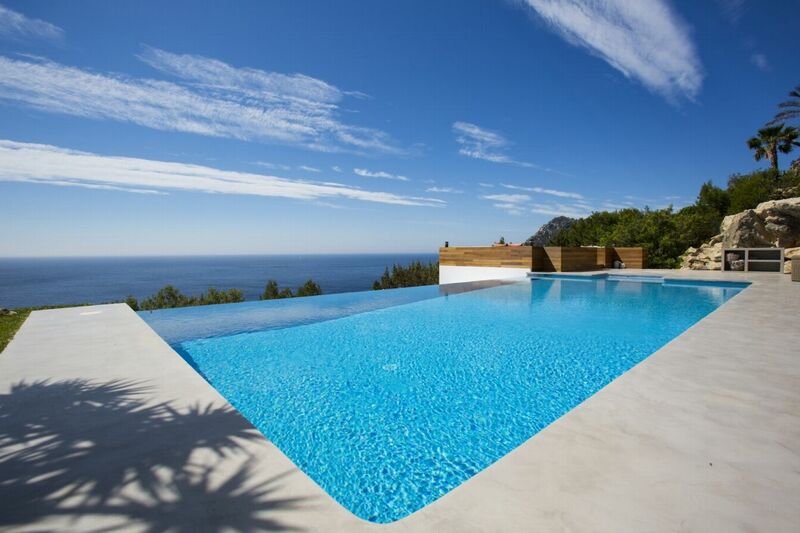 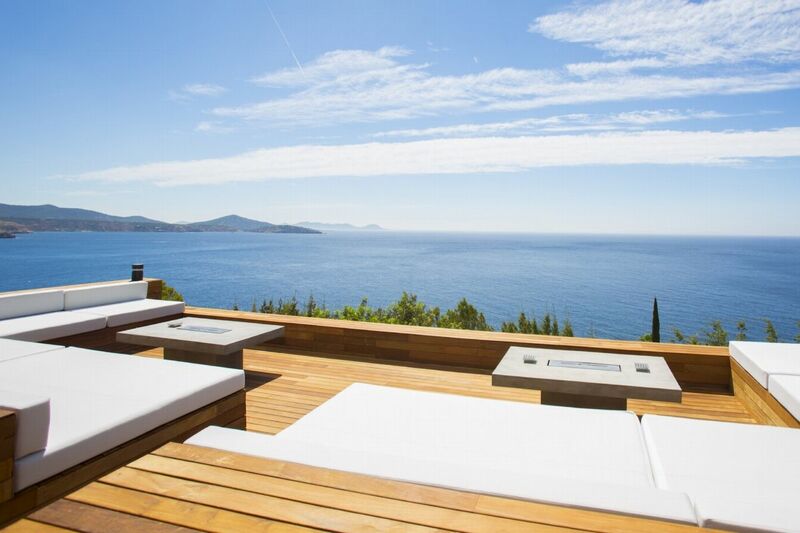 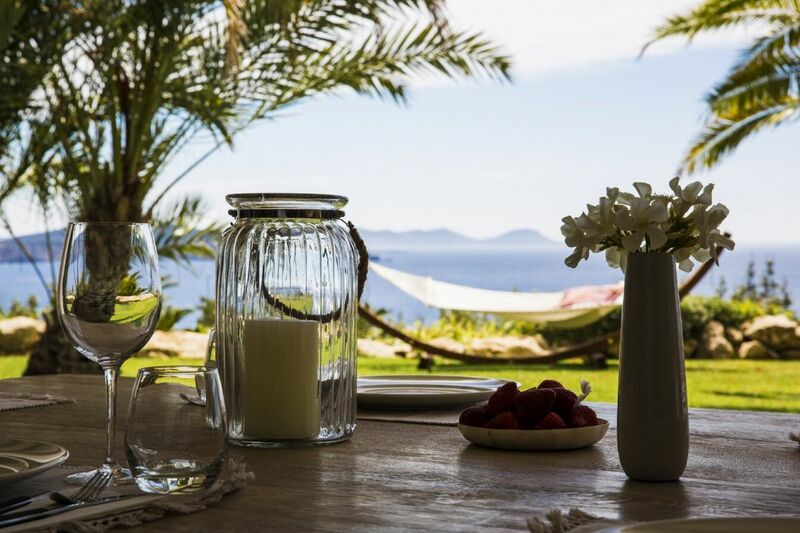 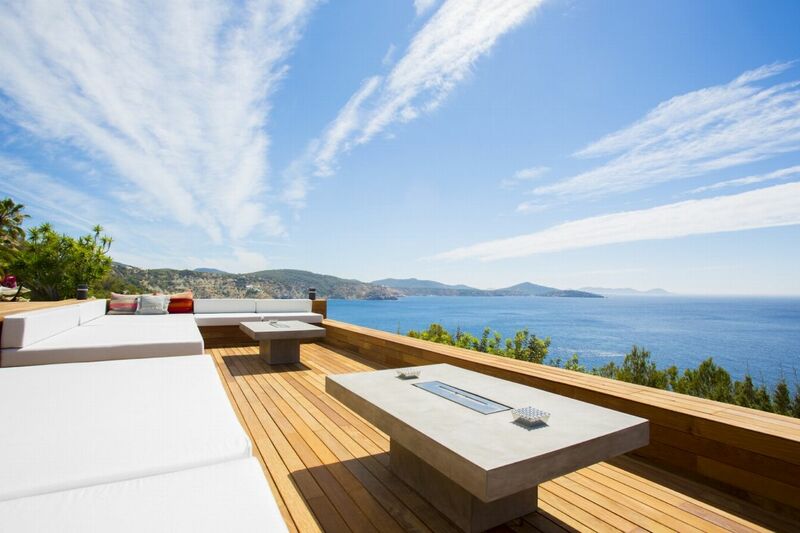 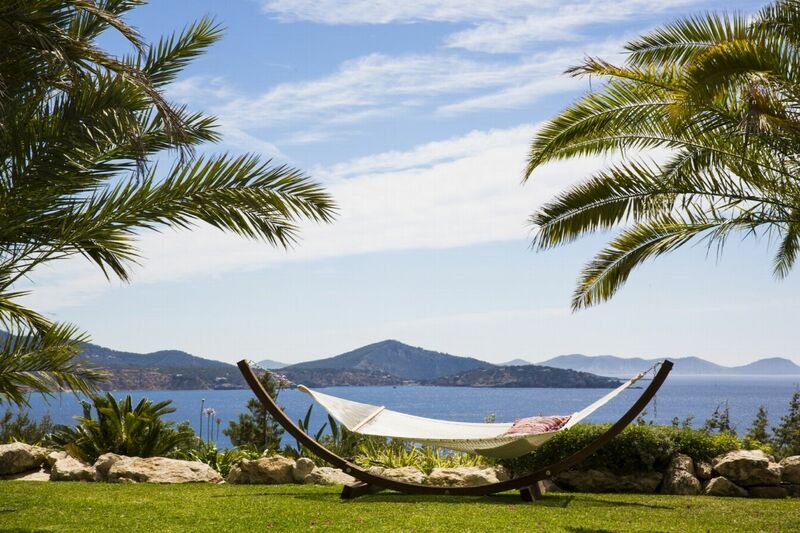 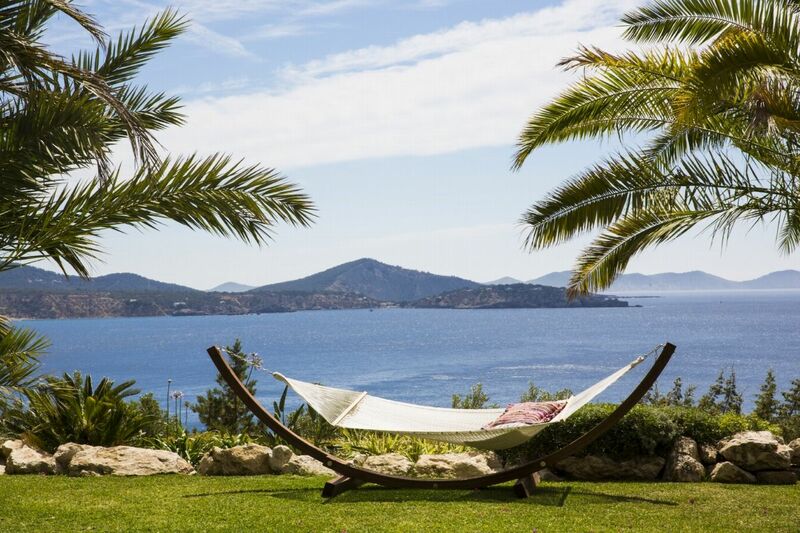 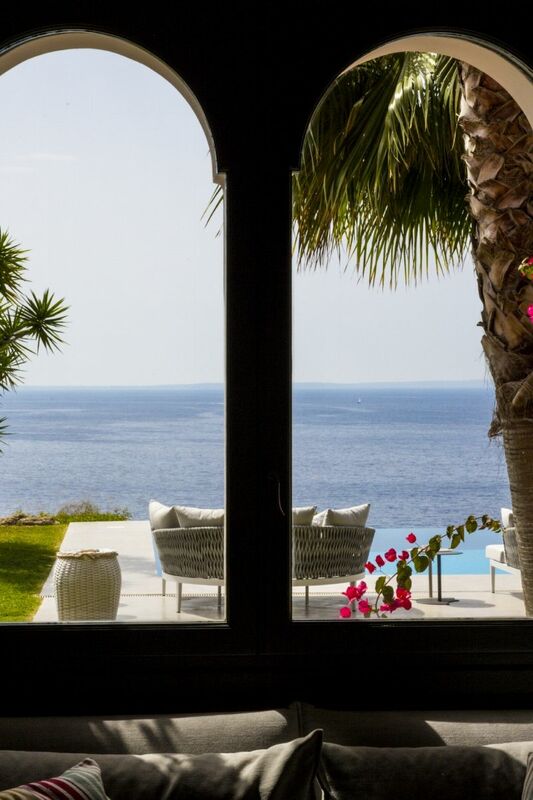 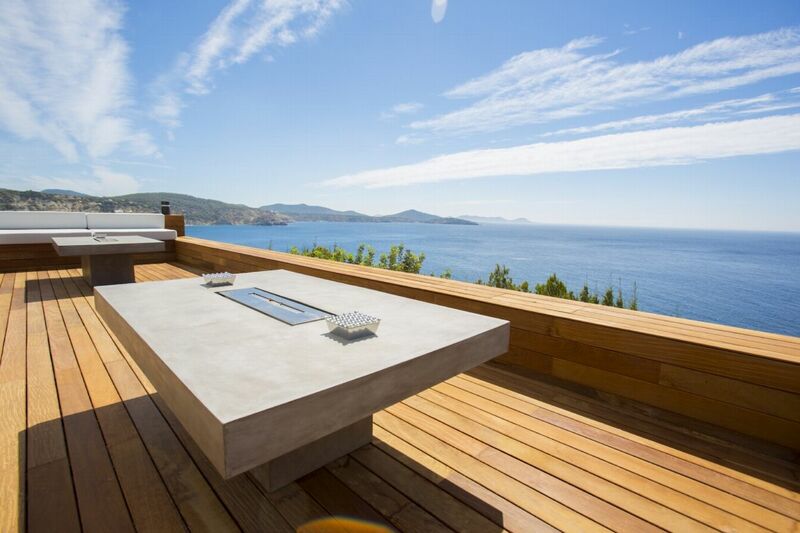 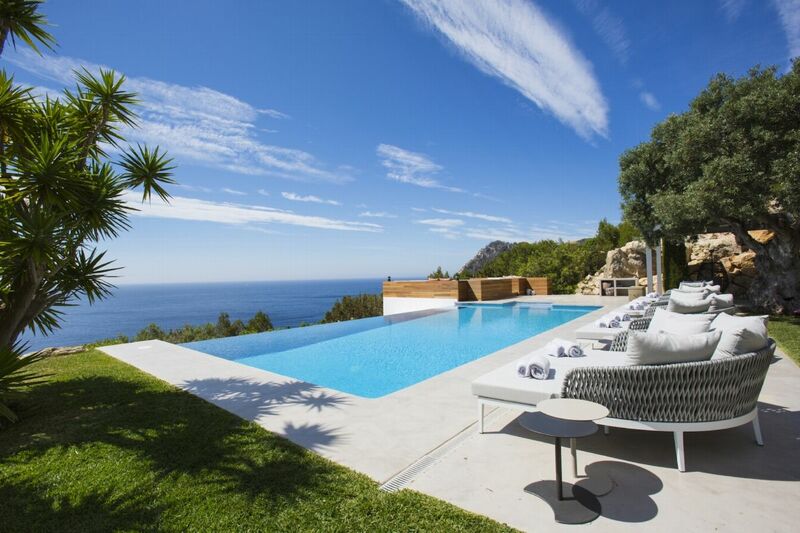 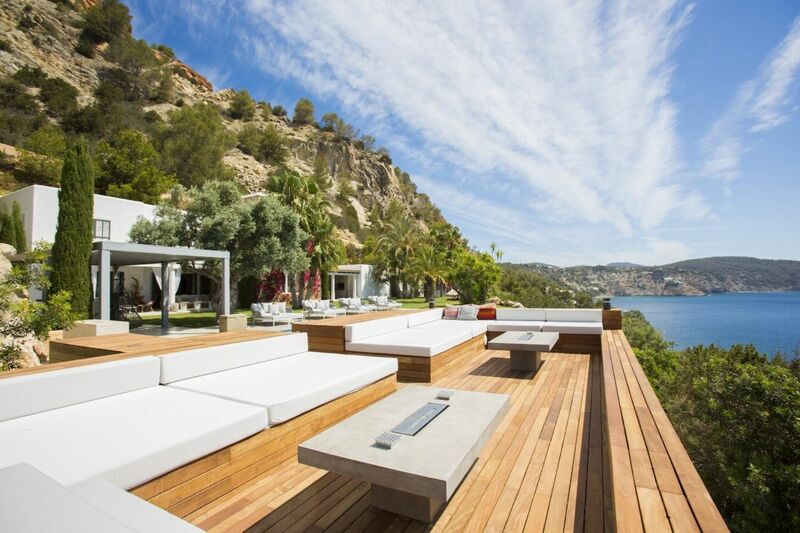 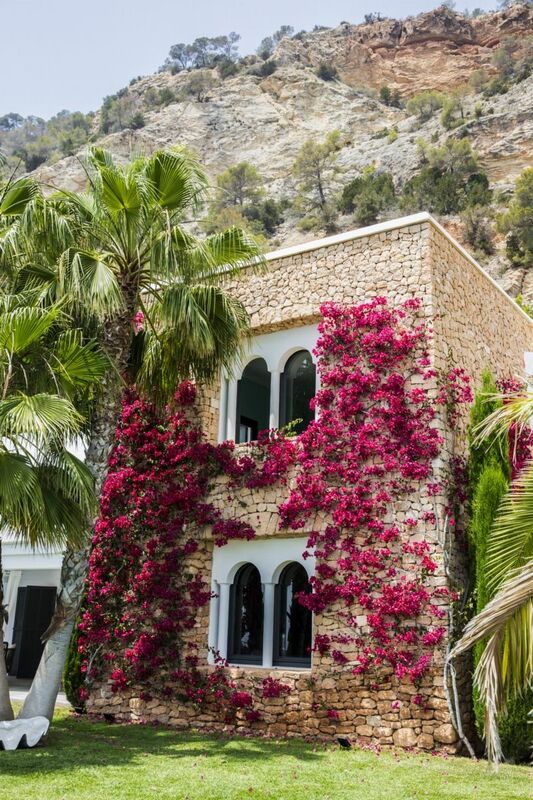 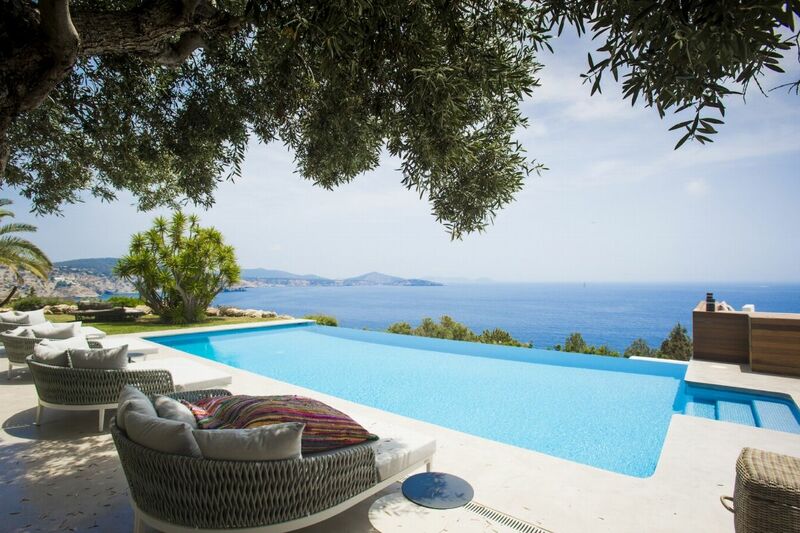 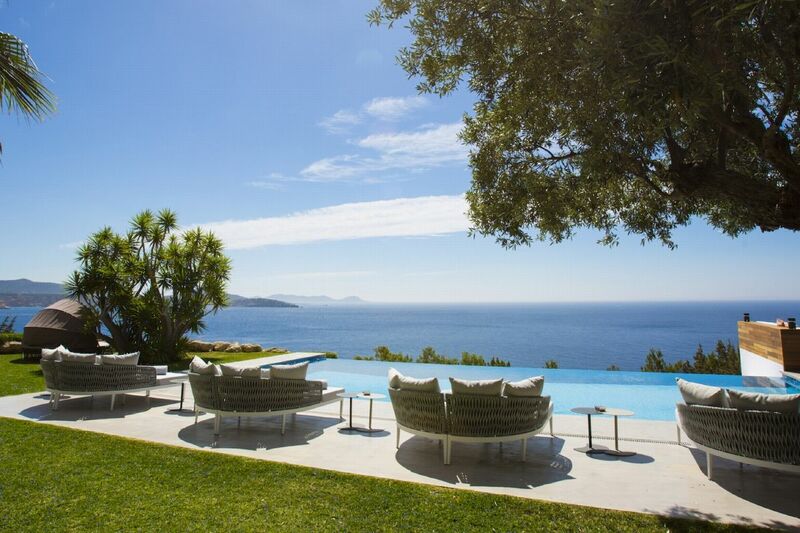 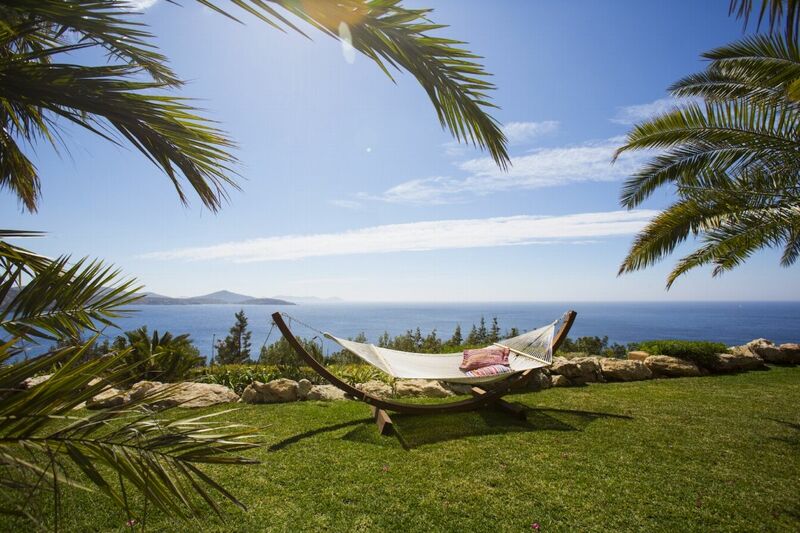 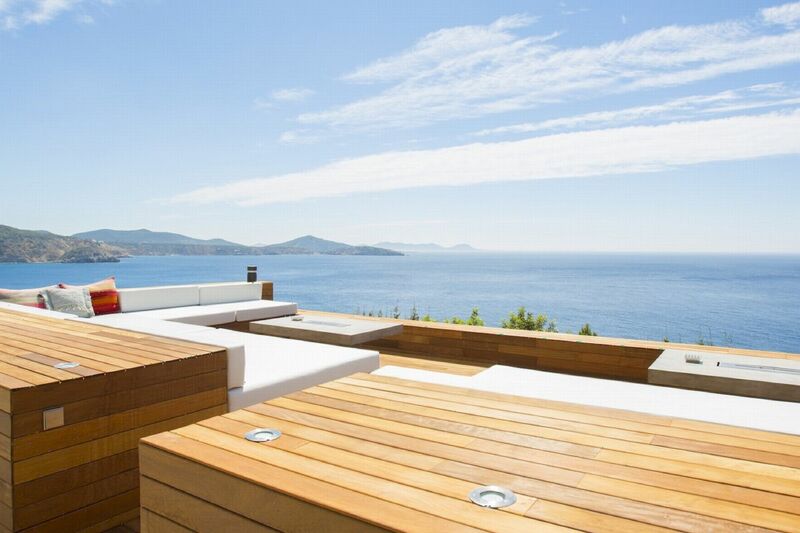 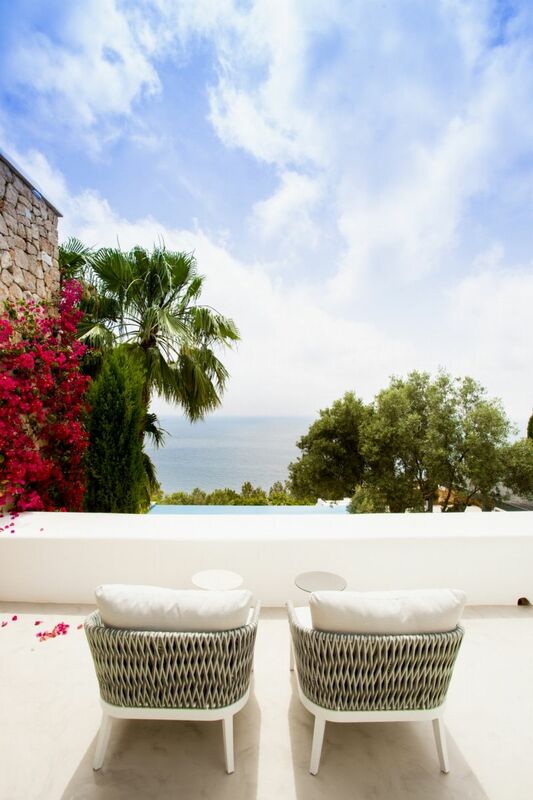 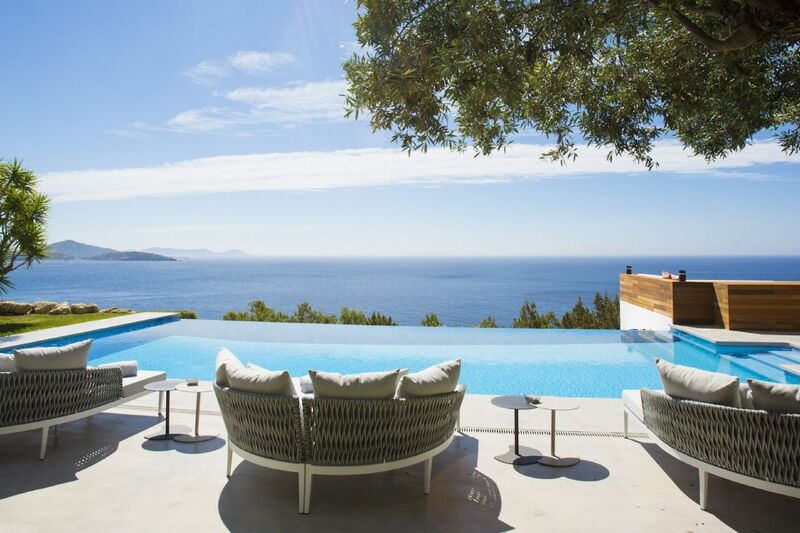 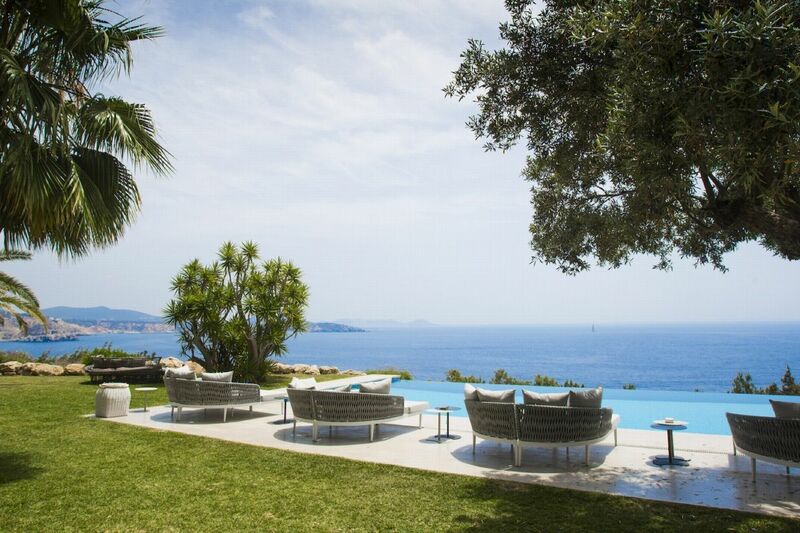 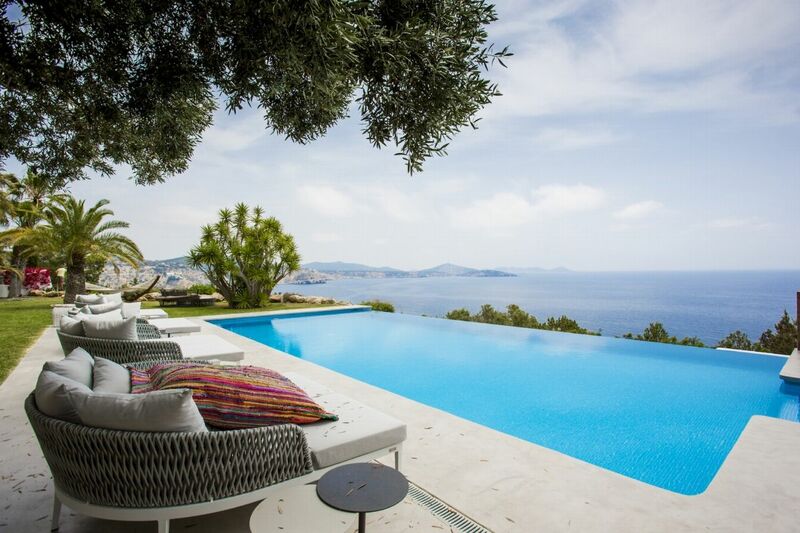 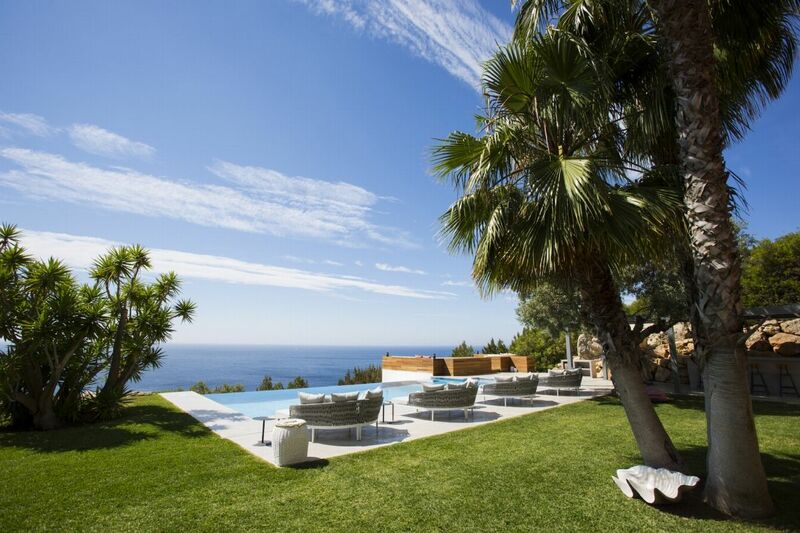 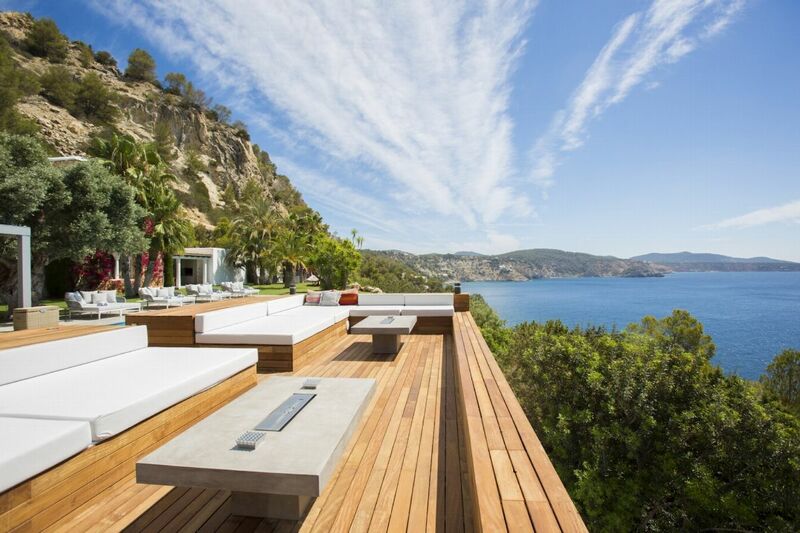 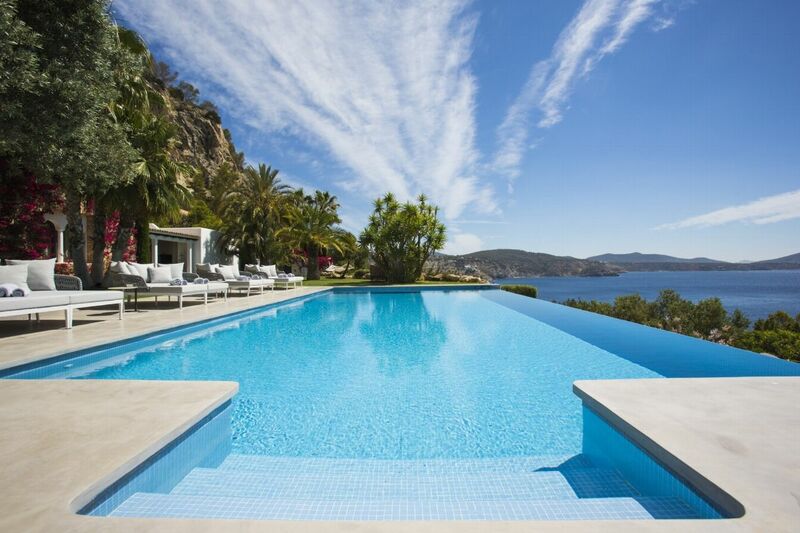 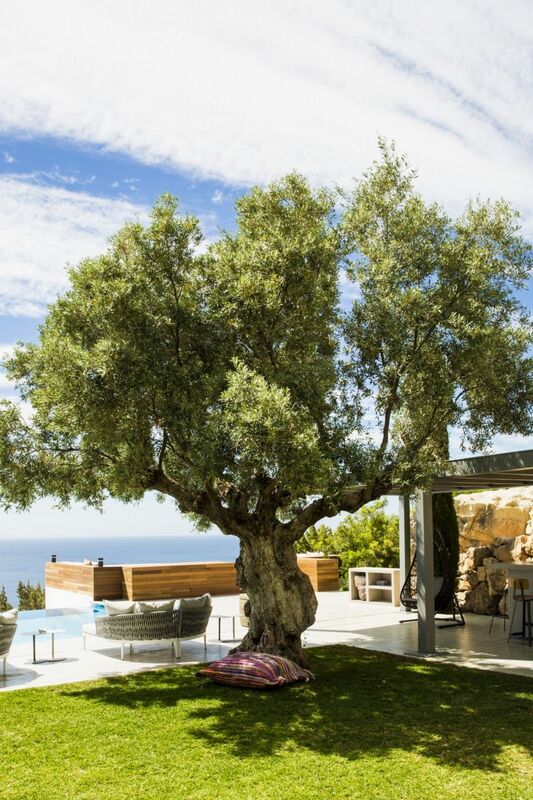 Perched on the side of a cliff facing the calm waters of Es Cubells Natural Park, this villa is located in â€¨the most exclusive private urbanization in Ibiza consisting of 15 amazing, independent villas with 24 hours security. 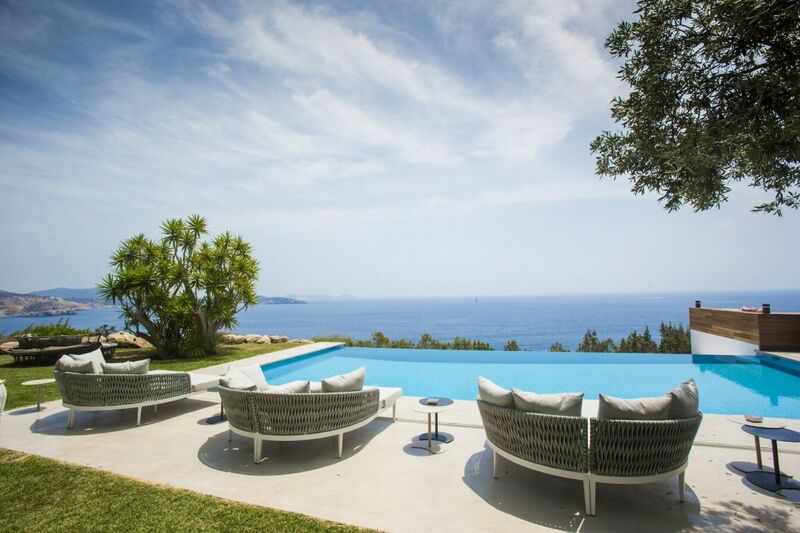 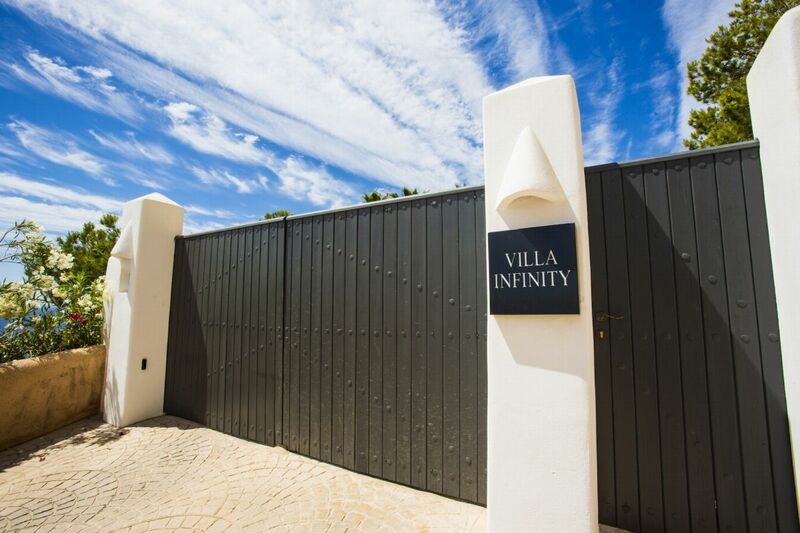 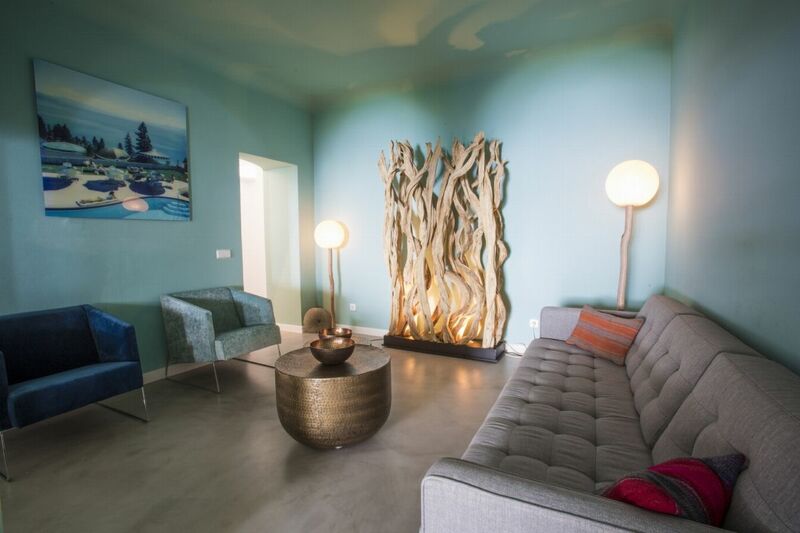 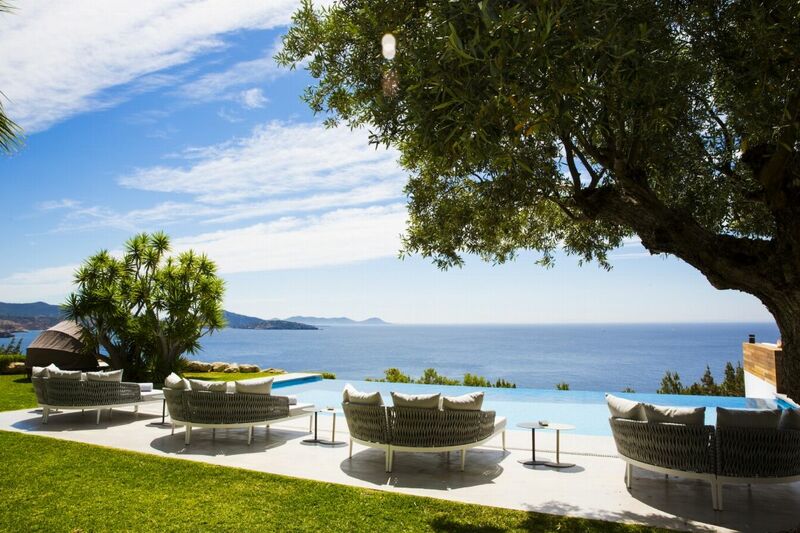 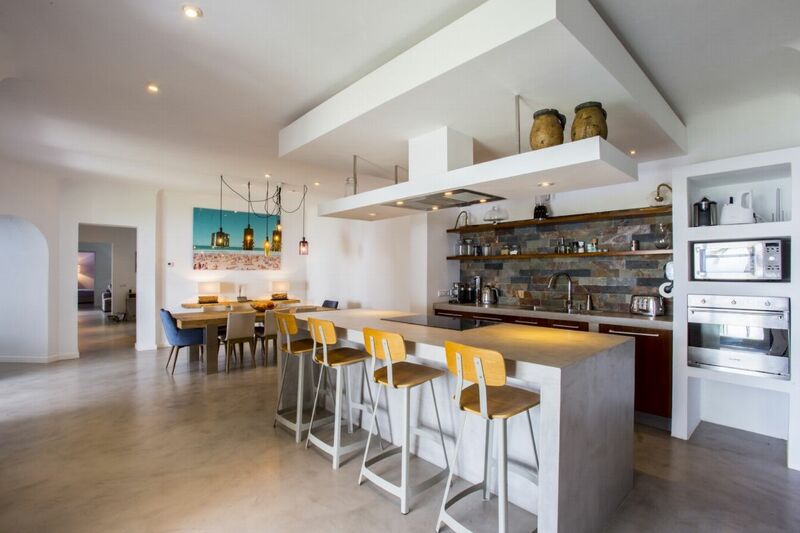 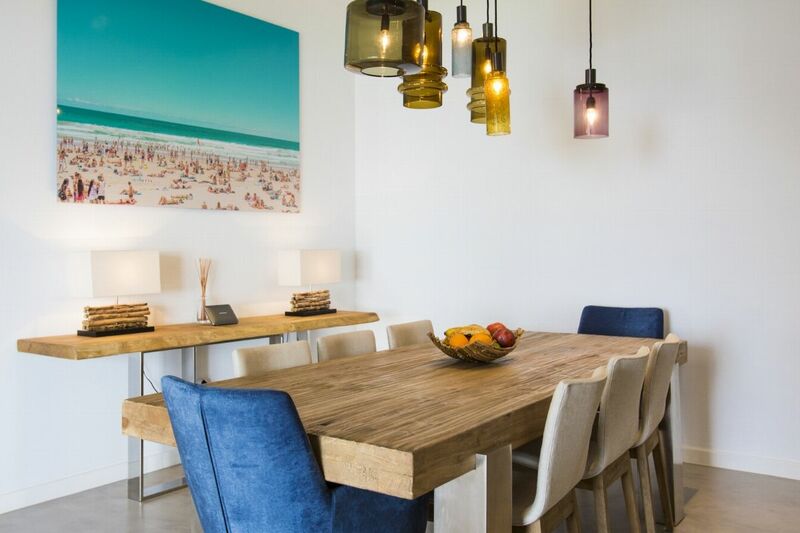 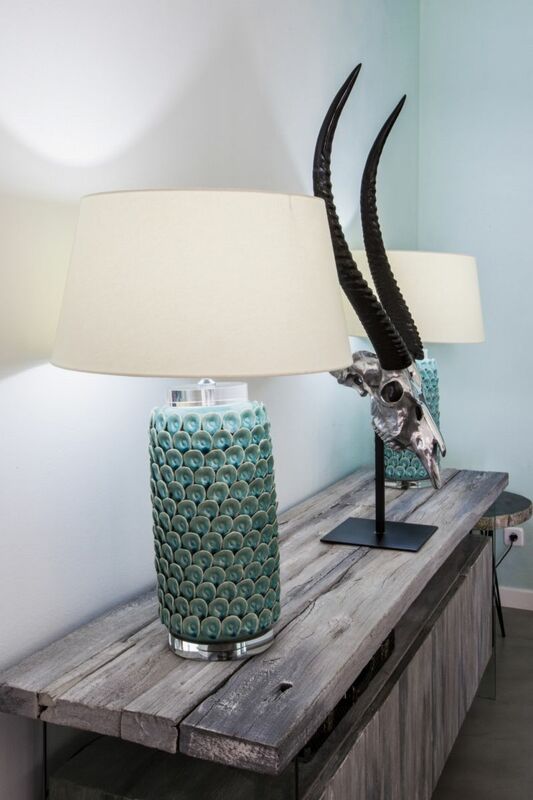 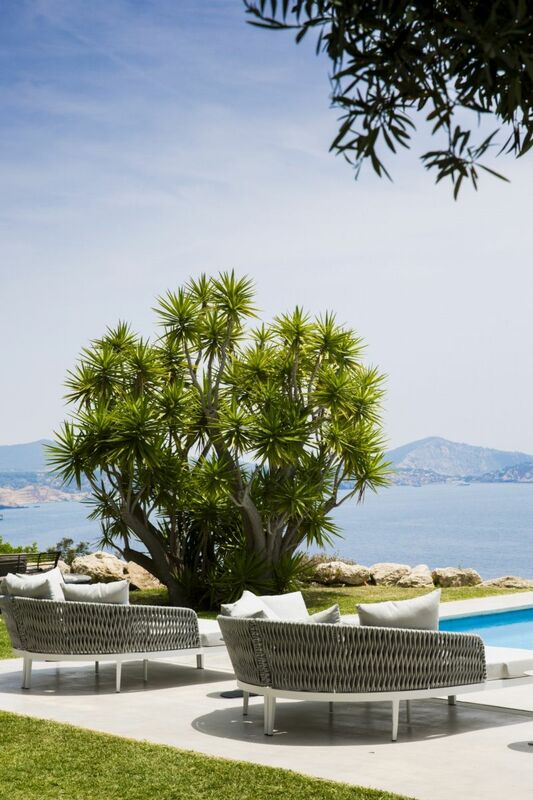 This fully renovated stylish villa with sea views spans 600 m2 of indoor living space that offers a seemingly limitless view of blue - ocean and sky melting into each other. 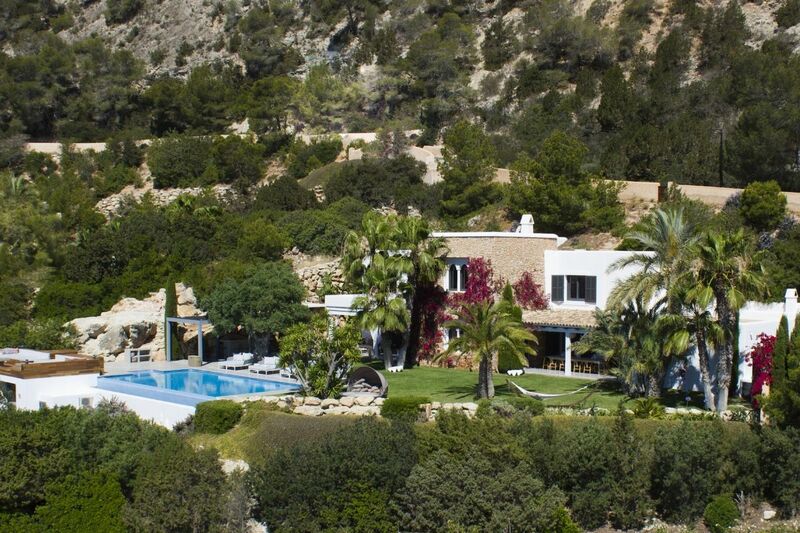 Only 1 minute away from Ses Boques Beach in which our clients have priority access and 5 minutes from Cala Jondal Beach. 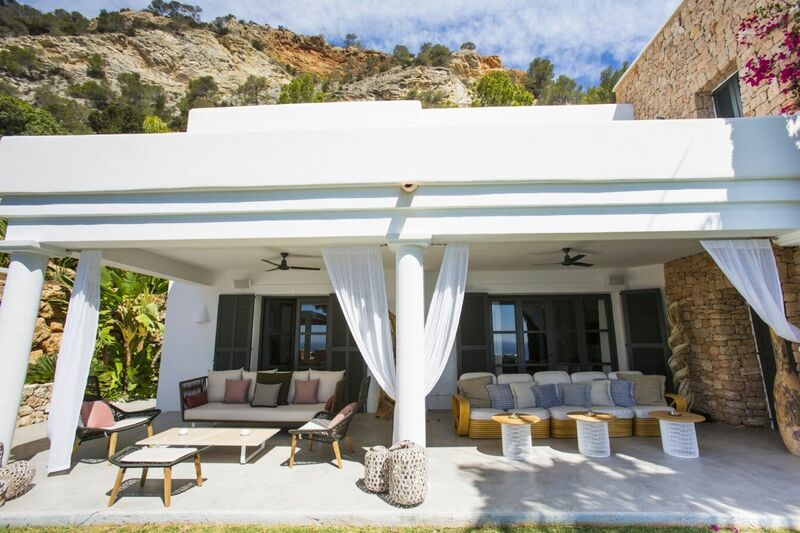 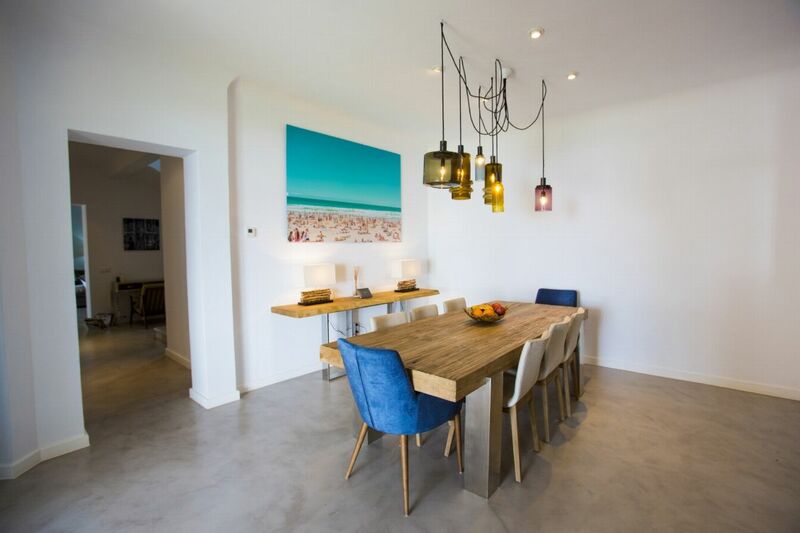 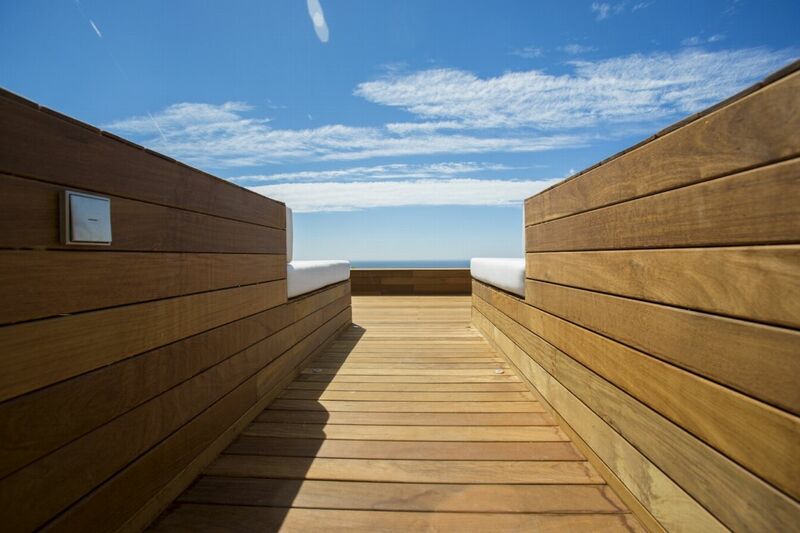 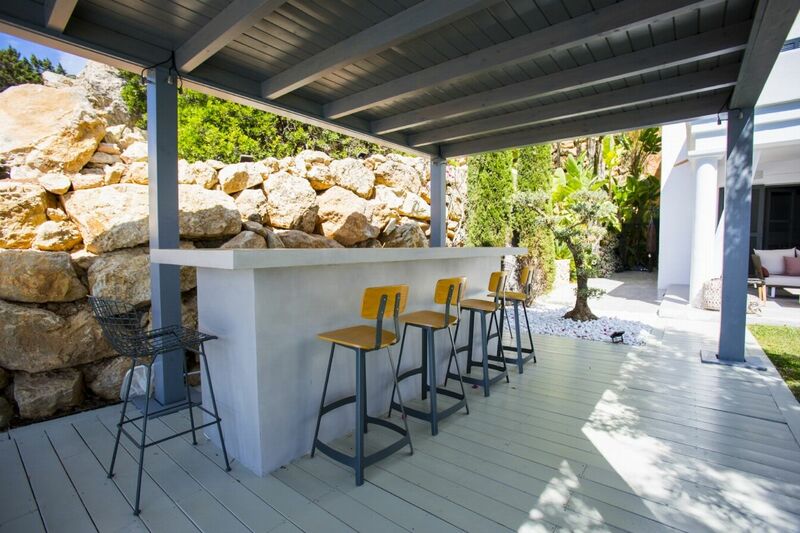 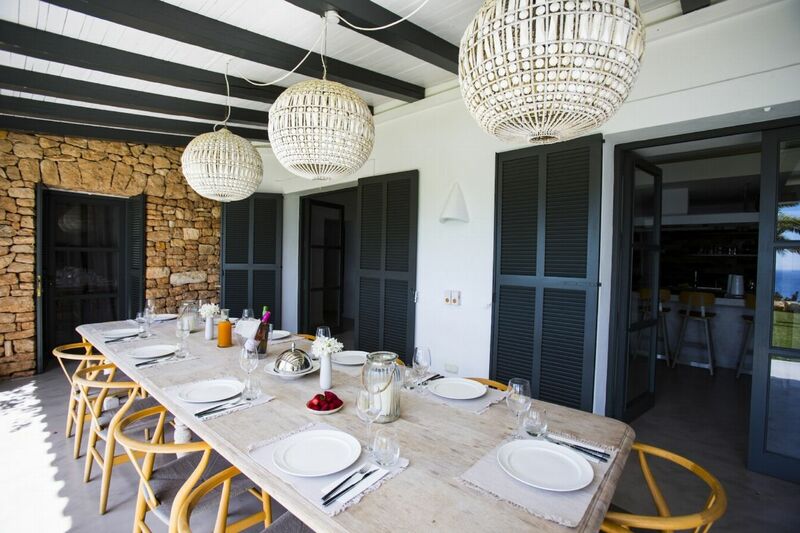 The property boasts a superb infinity poolâ€¨, as well as a spacious sun terraceâ€¨, outdoor BBQâ€¨/Dining area easily seating 14 people, chill out area where the sunset can be enjoyed and car parking. 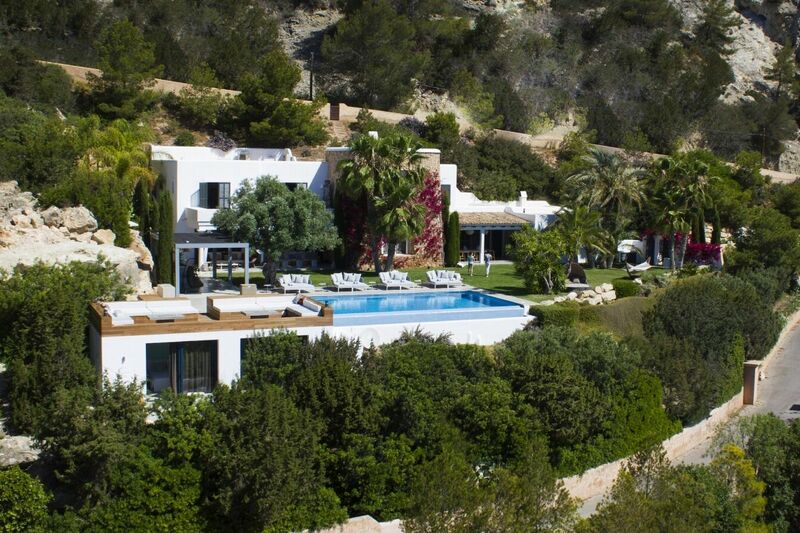 Airport: 10minâ€¨, Ibiza Town: 15 min, Nearest Shop: 3 min, Nearest Beach: 1 min, Nearest restaurant: 1 min, Pacha Nightclub: 15 min. 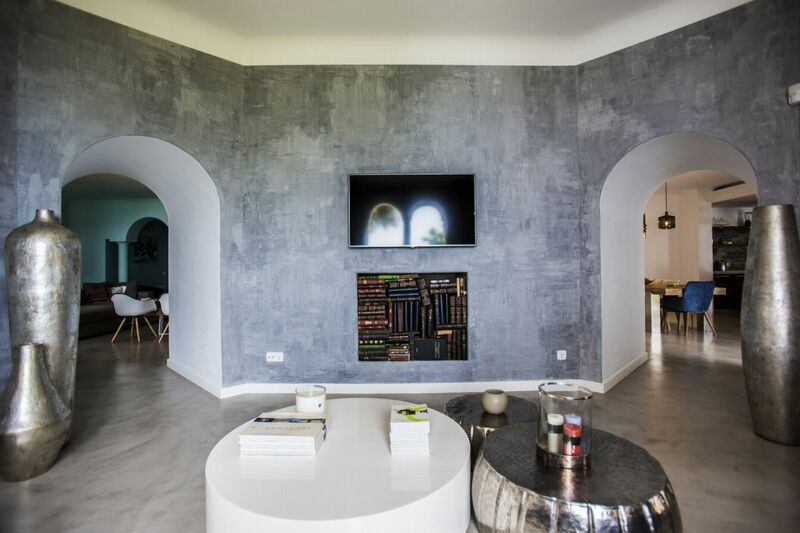 LIVING AREAS There are 2 living rooms with features such as: home cinema, DVD, Apple TV, Bose Sound Systems, Sonos Multi Room Audio System and international Satellite HD TV. 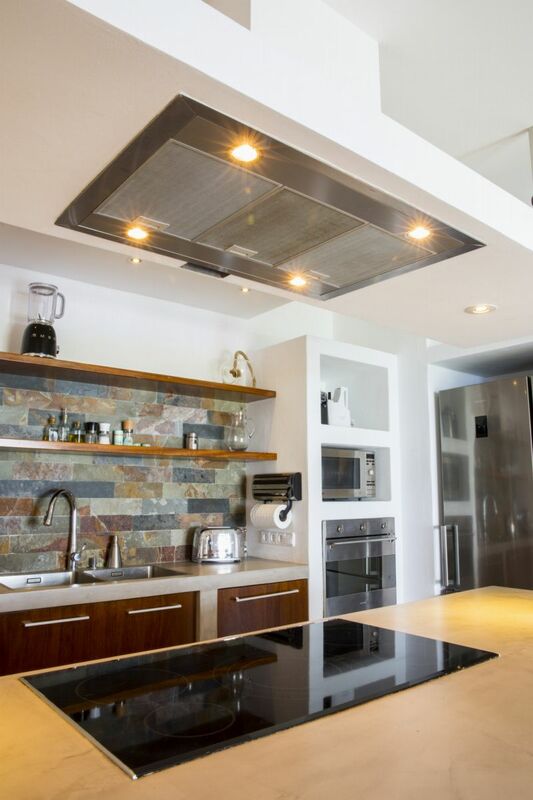 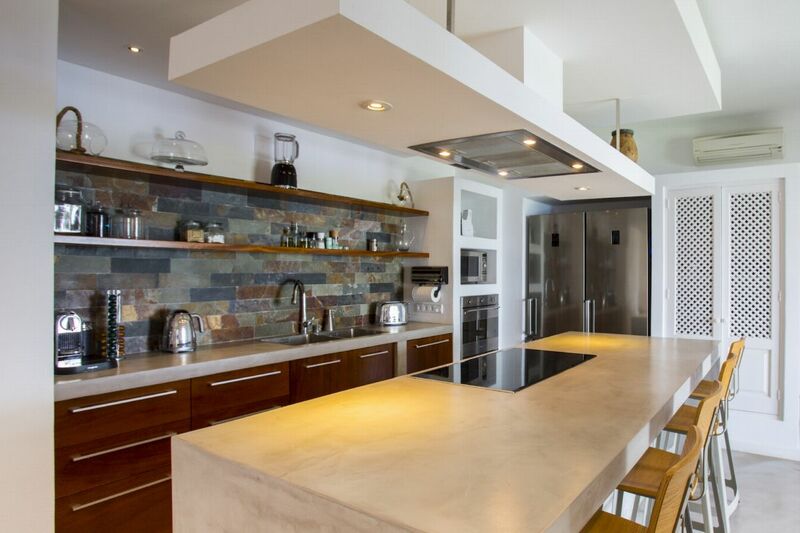 The fully equipped kitchen is very modern containing all appliances as well as a breakfast bar. 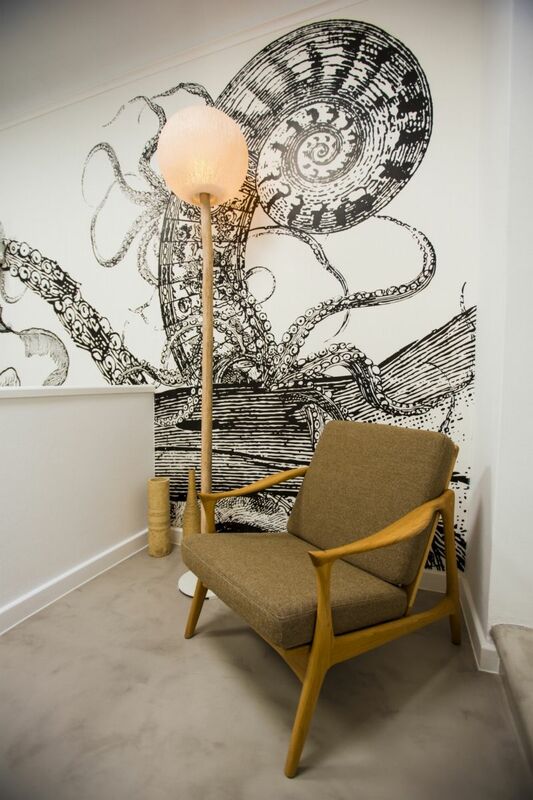 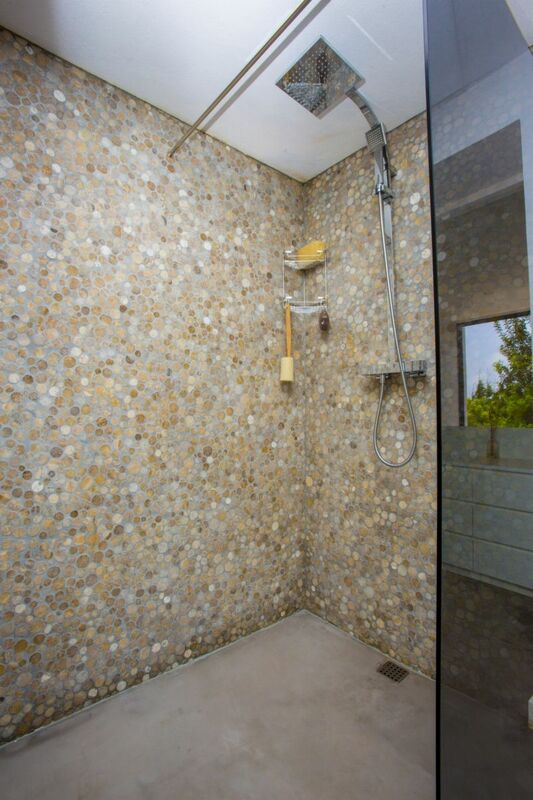 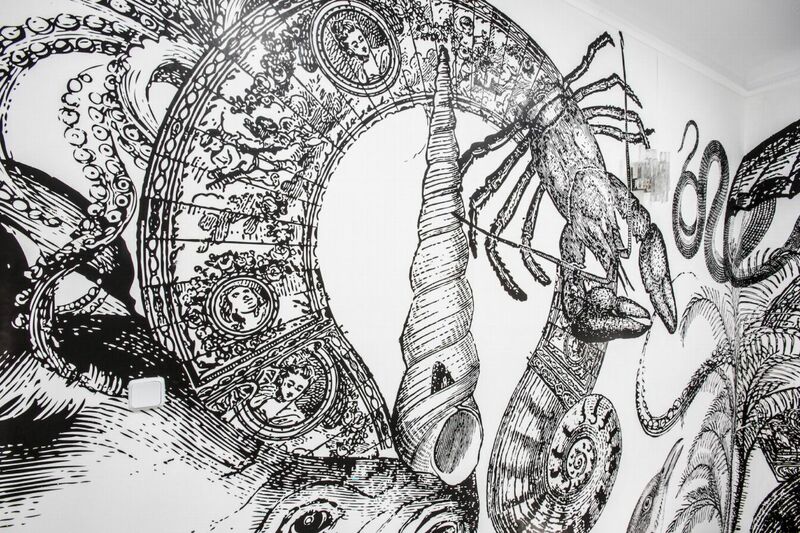 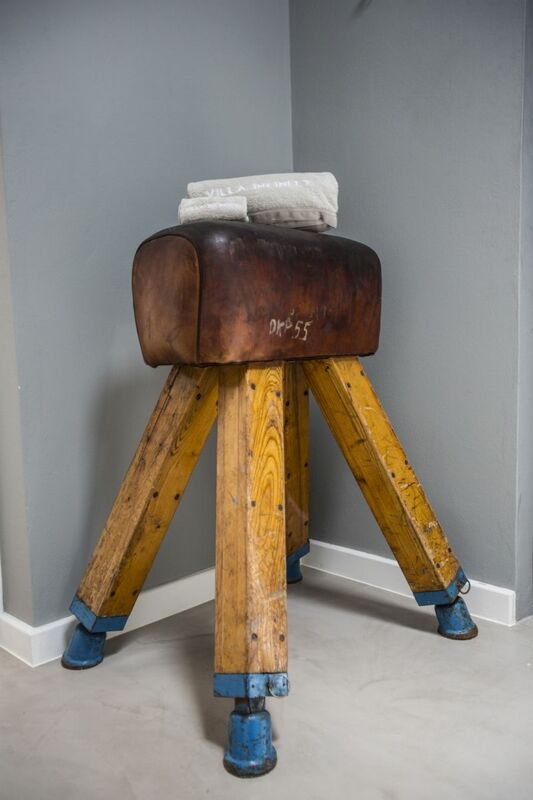 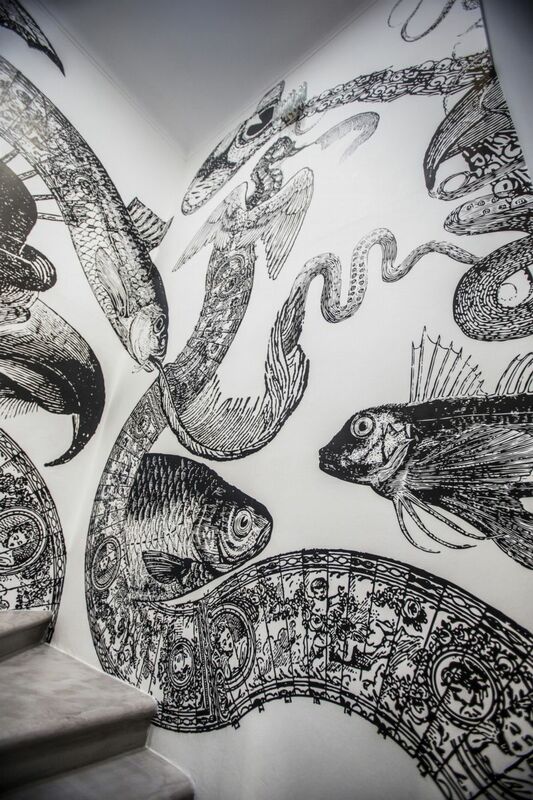 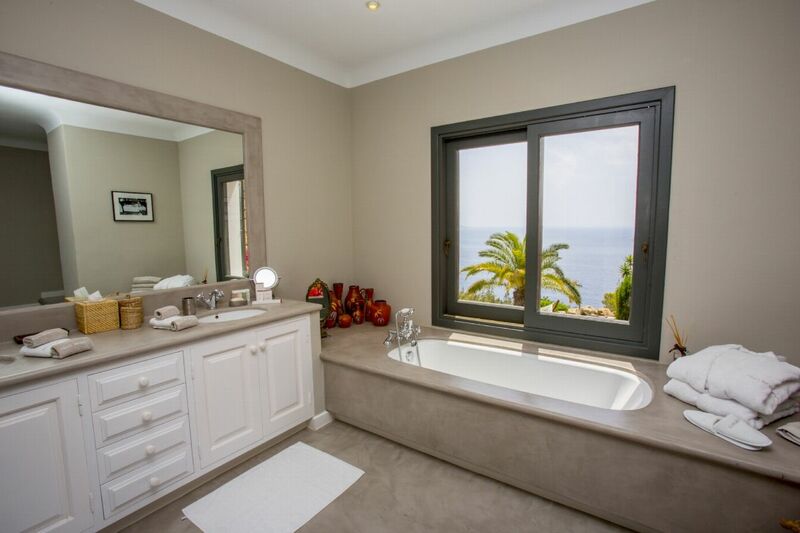 There is also a guest WC, gym facilitiesâ€¨ and a laundry room. 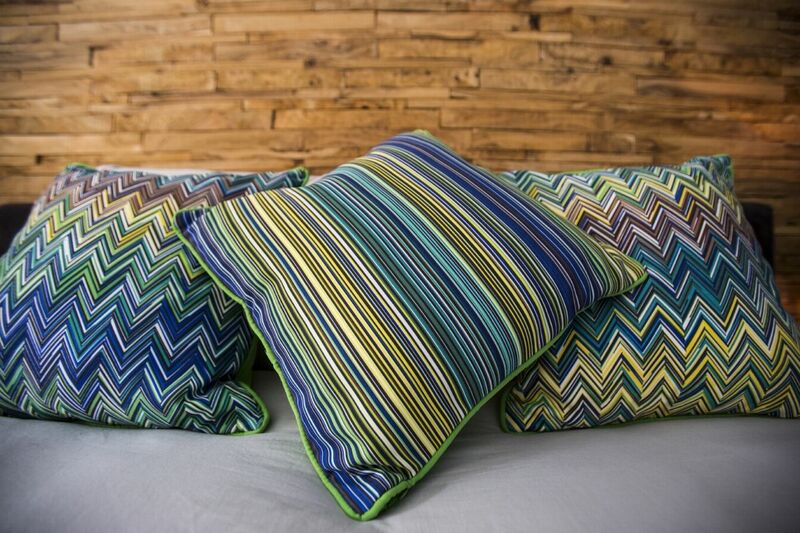 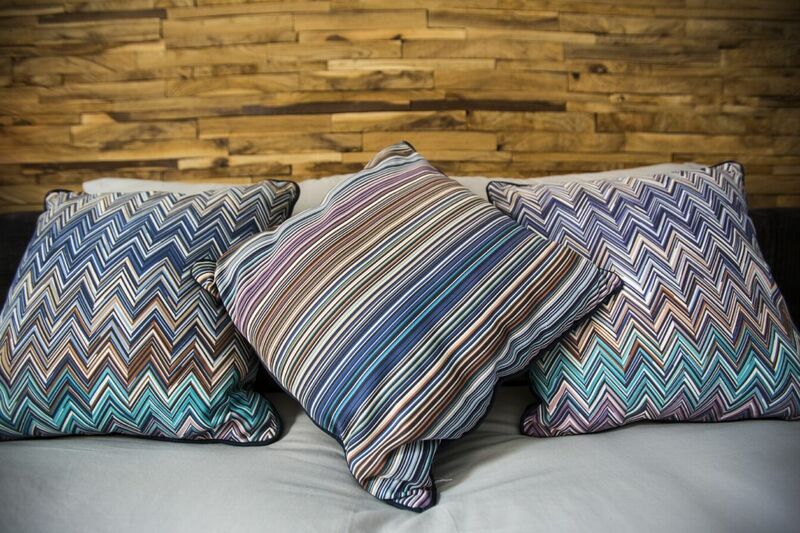 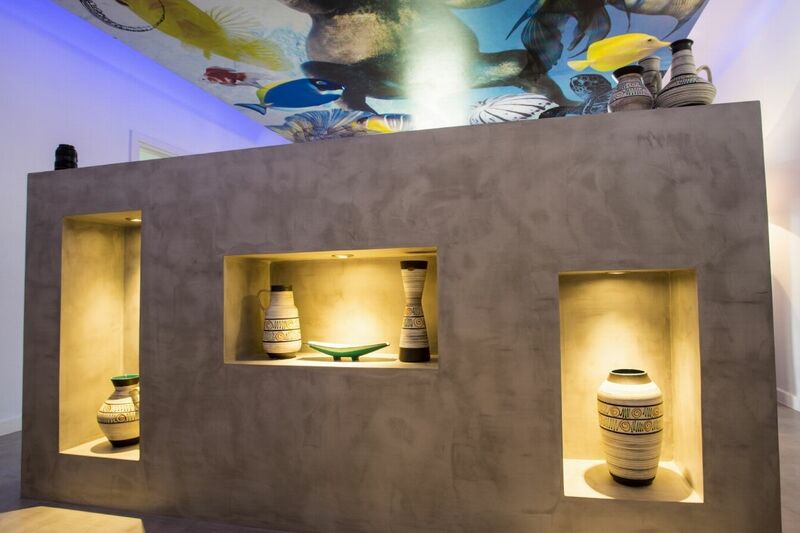 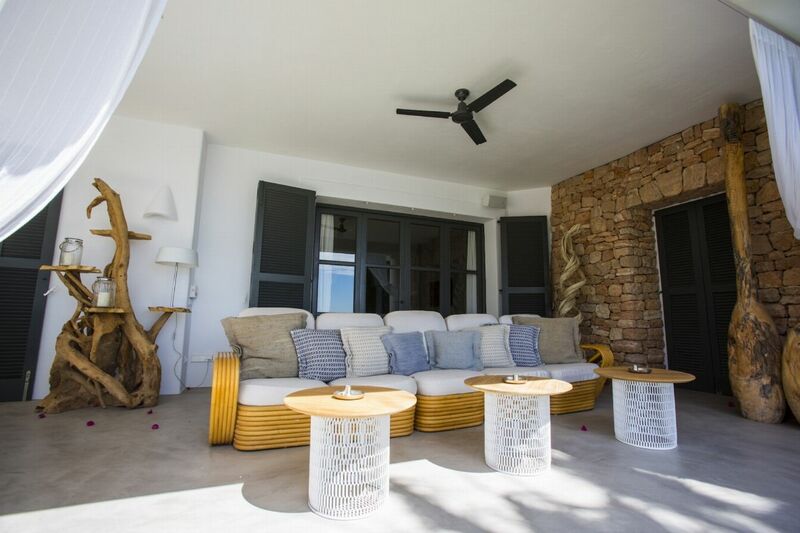 Air conditioning is throughout andâ€¨ high speed WiFi is available in all rooms and terraces. 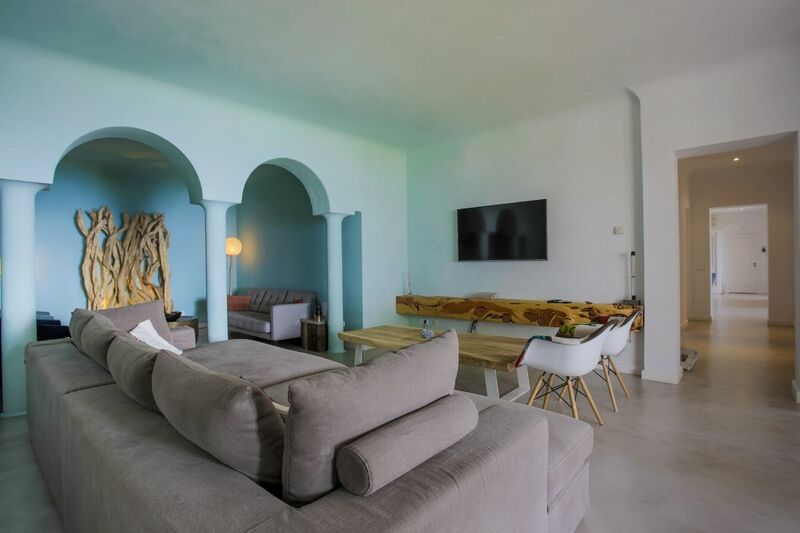 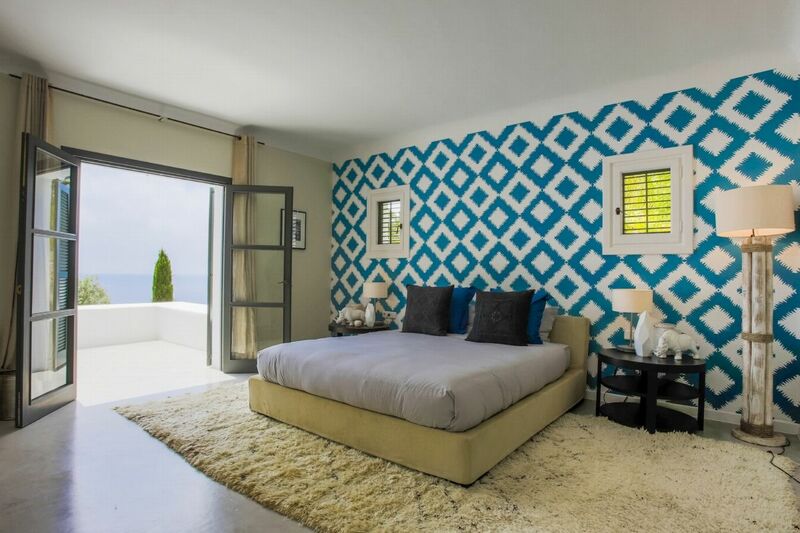 Master Suite - Elegant double room measuring 50 m2.â€¨ A luxury space located on the first floor of the villa with direct access to the spectacular outdoor terrace measuring 50 m2, with sun beds and spectacular views to the Mediterranean sea. 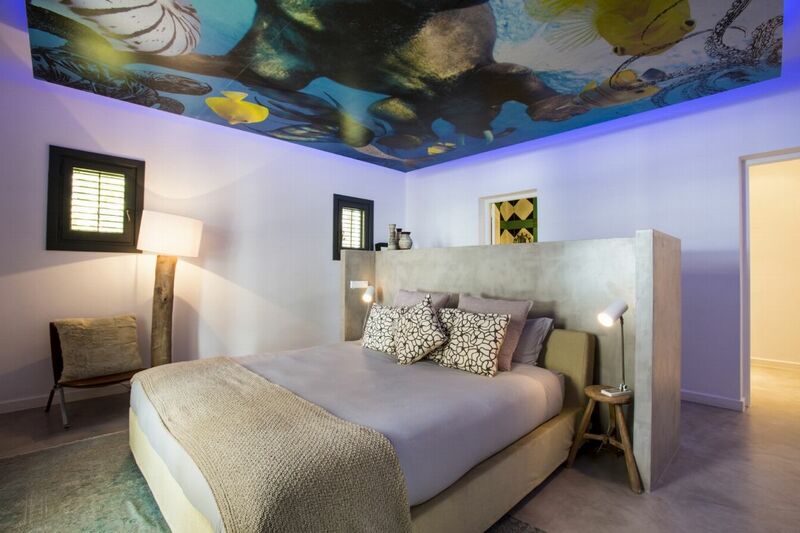 2nd Suite - 50 m2 double room, located on the ground floor of the villa and designed to offer a unique experience.â€¨ A spectacular ceiling design and coloured LED for a relaxing atmosphere. 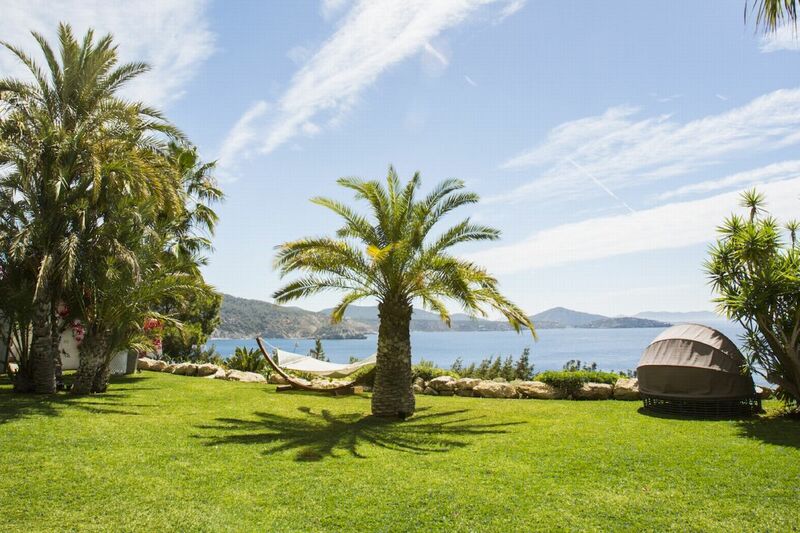 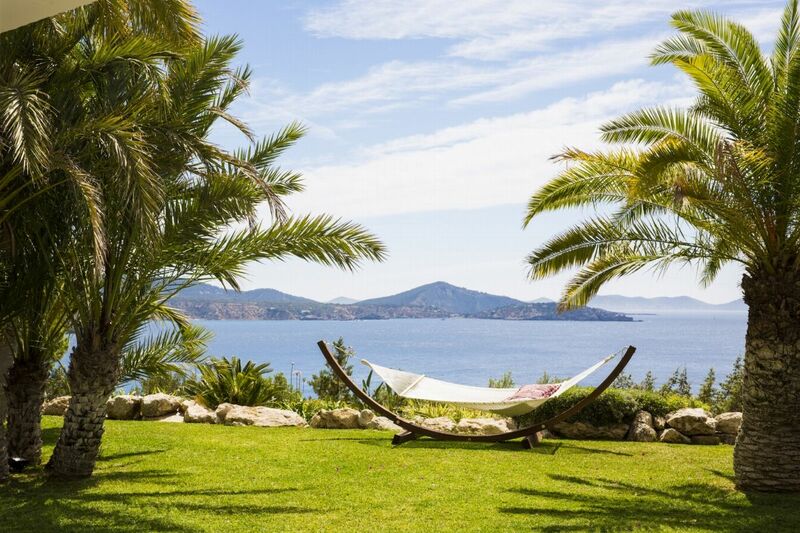 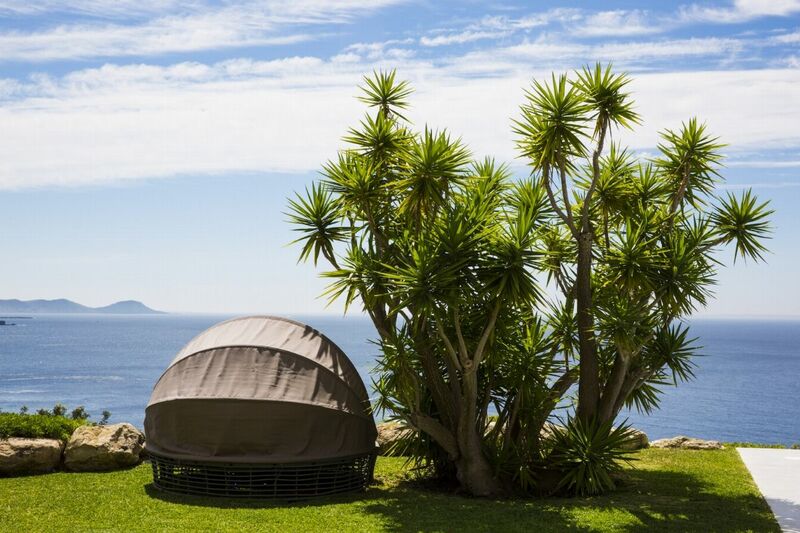 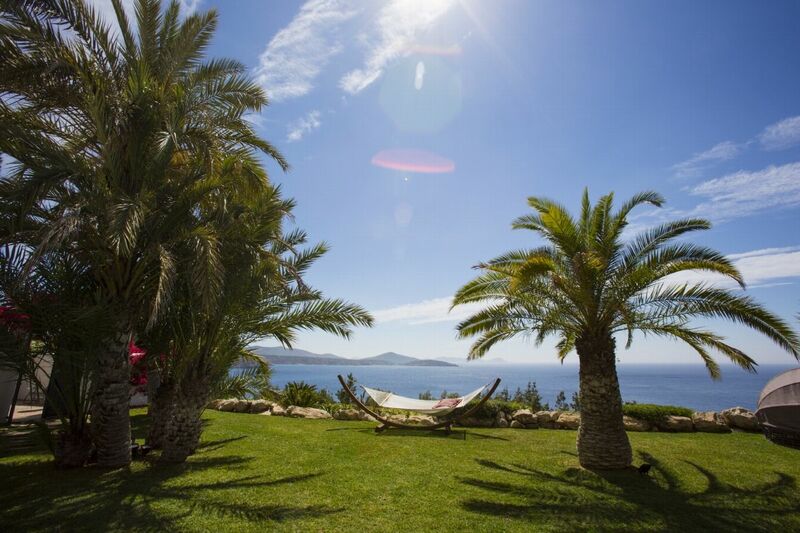 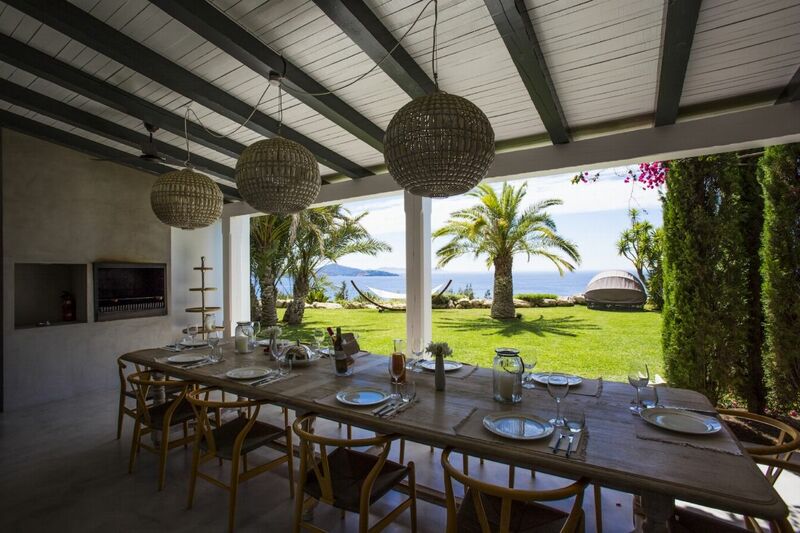 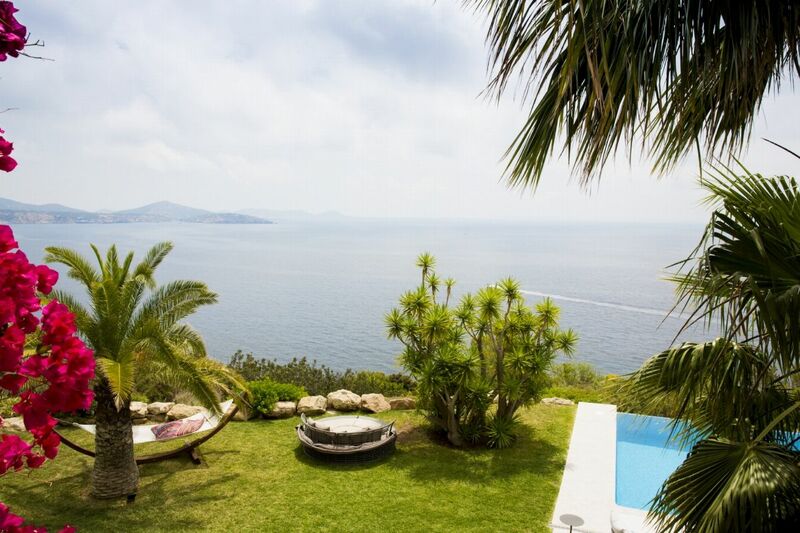 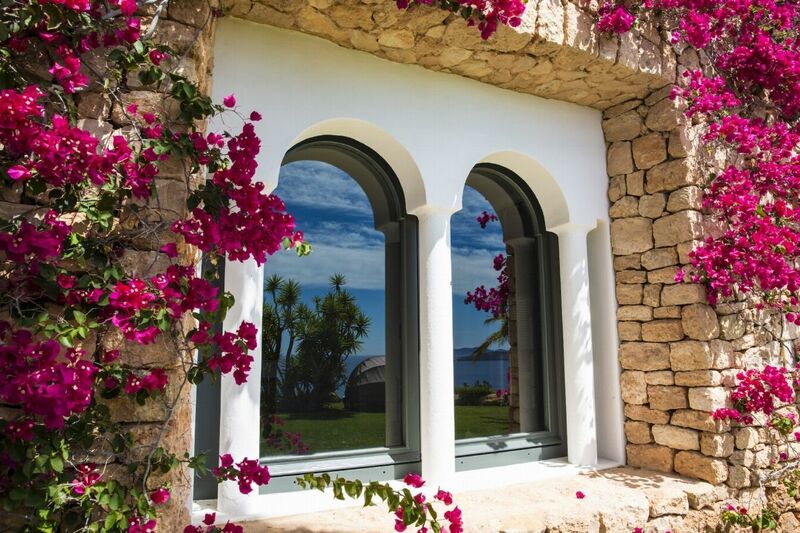 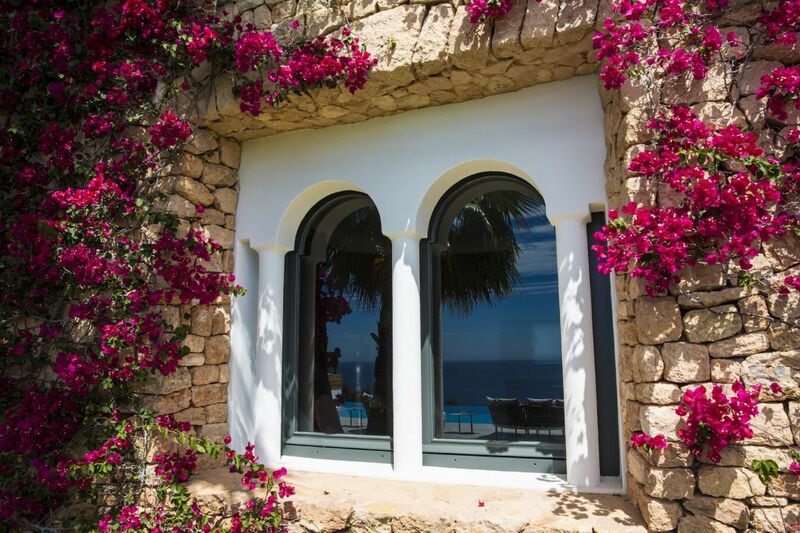 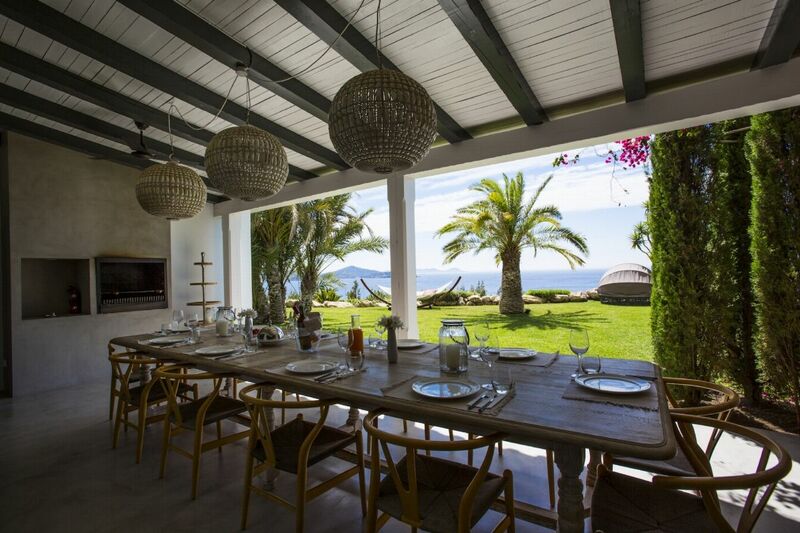 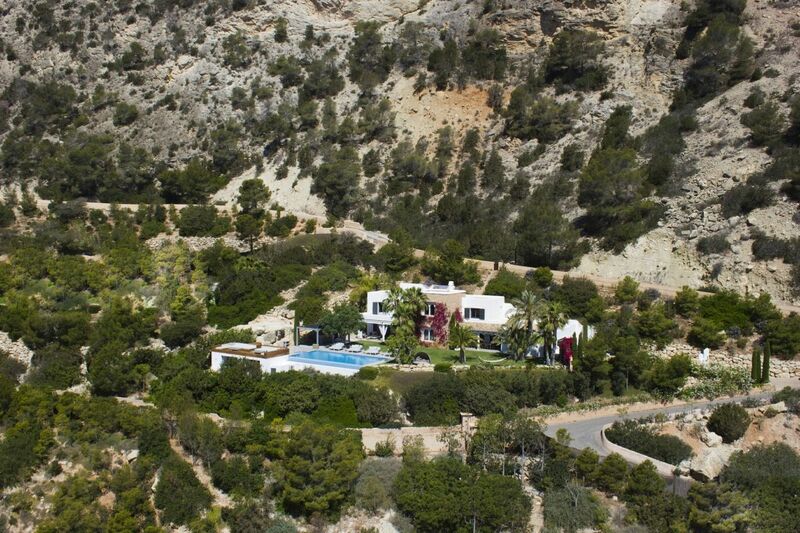 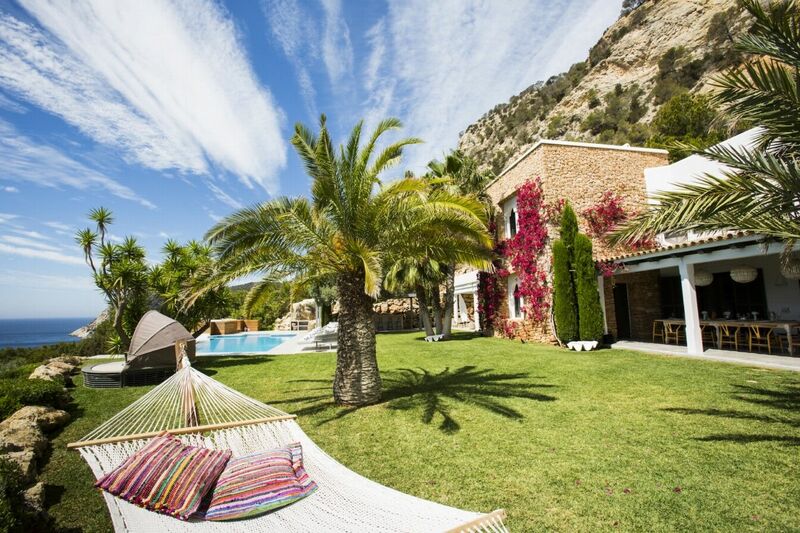 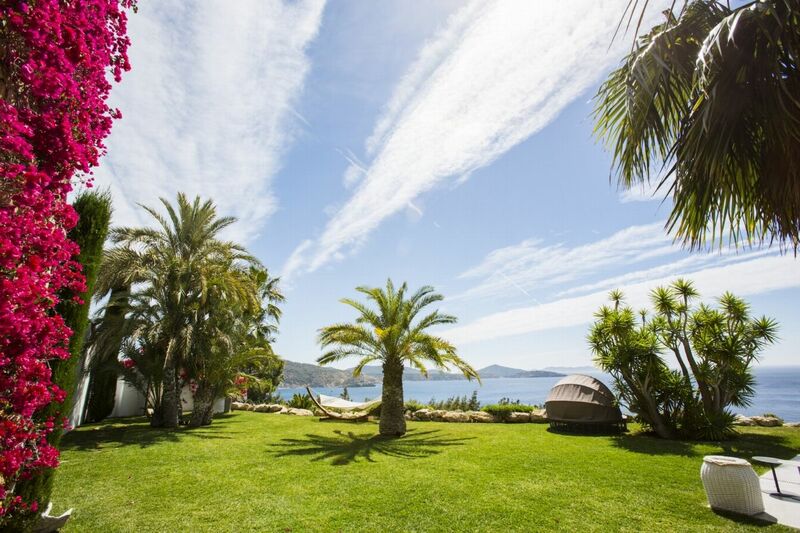 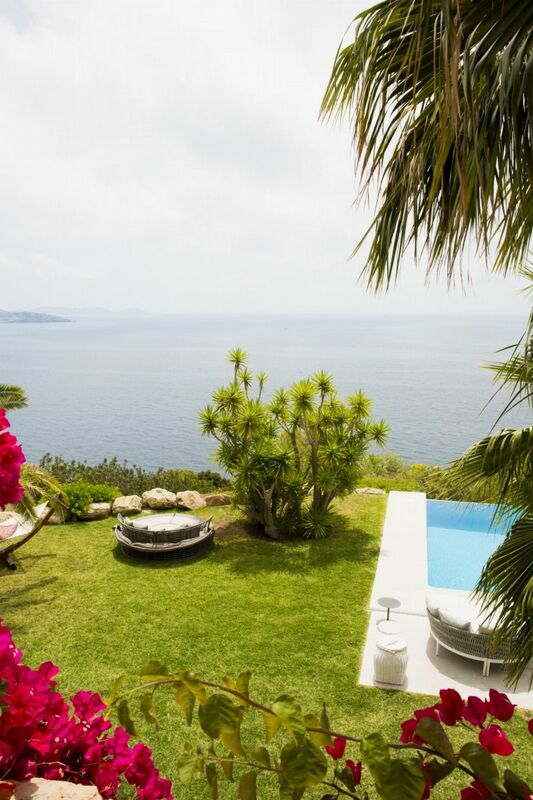 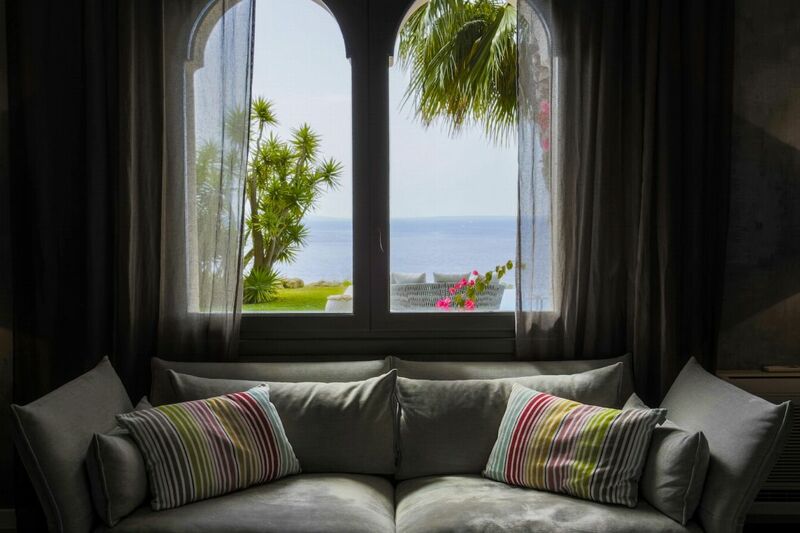 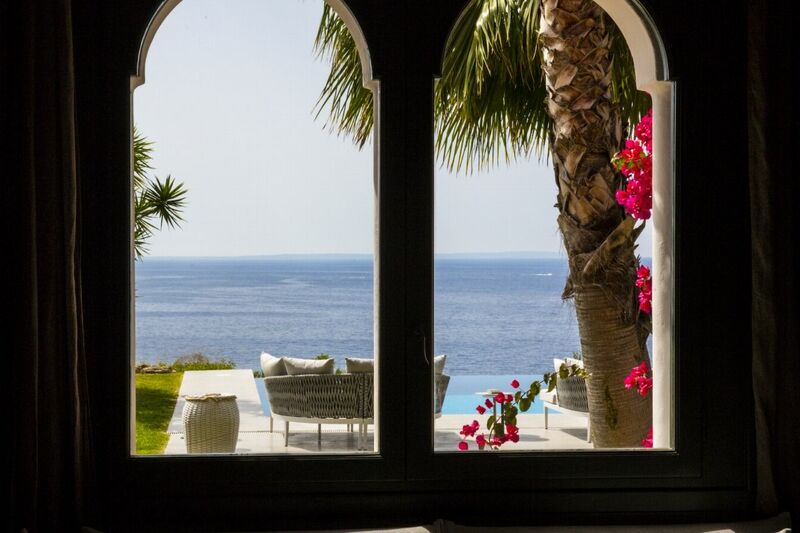 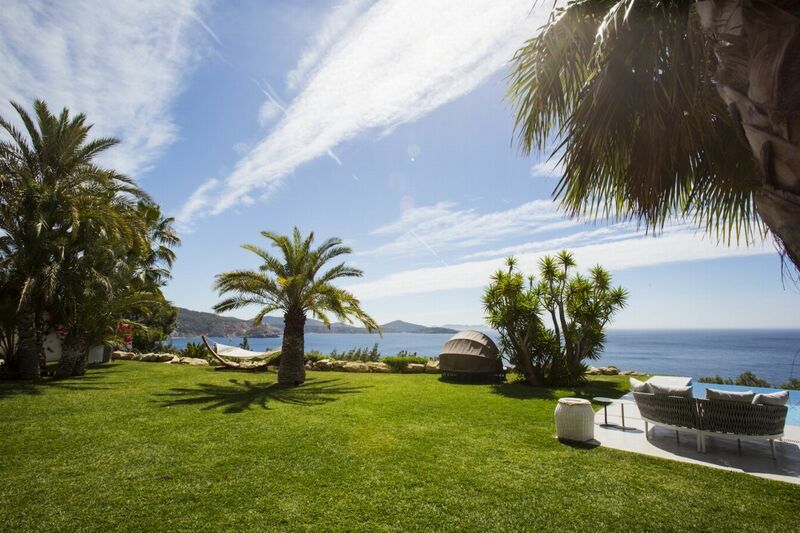 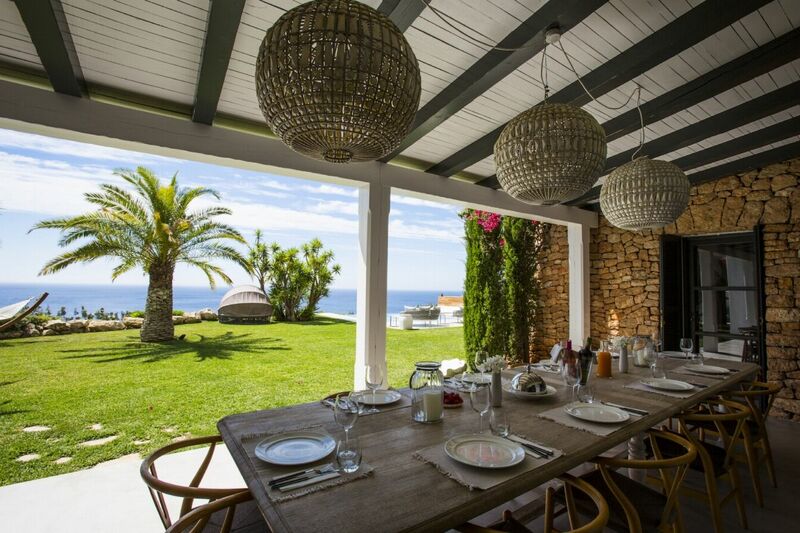 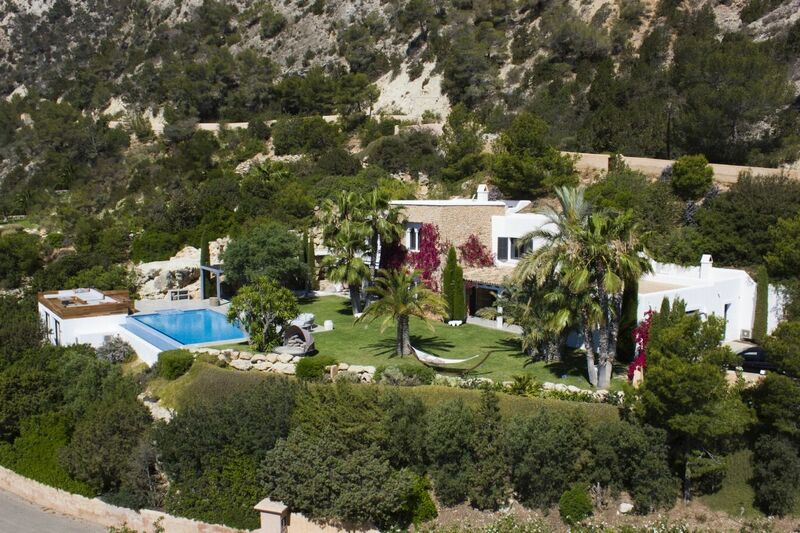 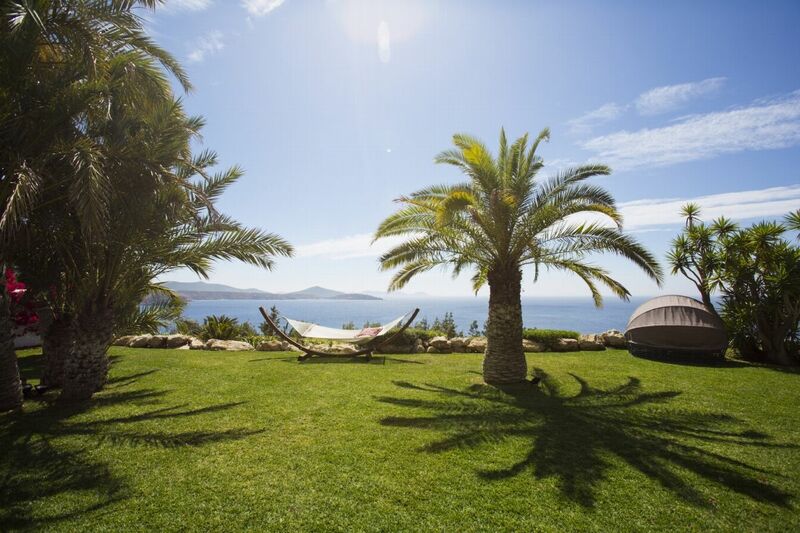 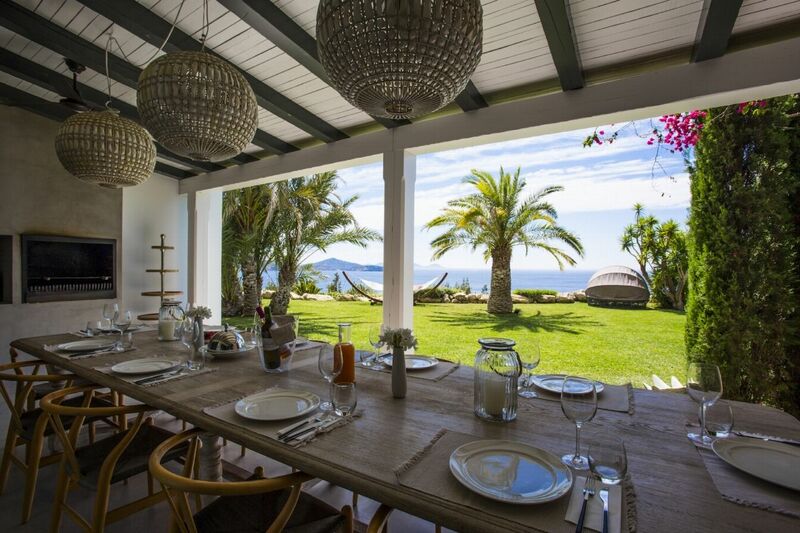 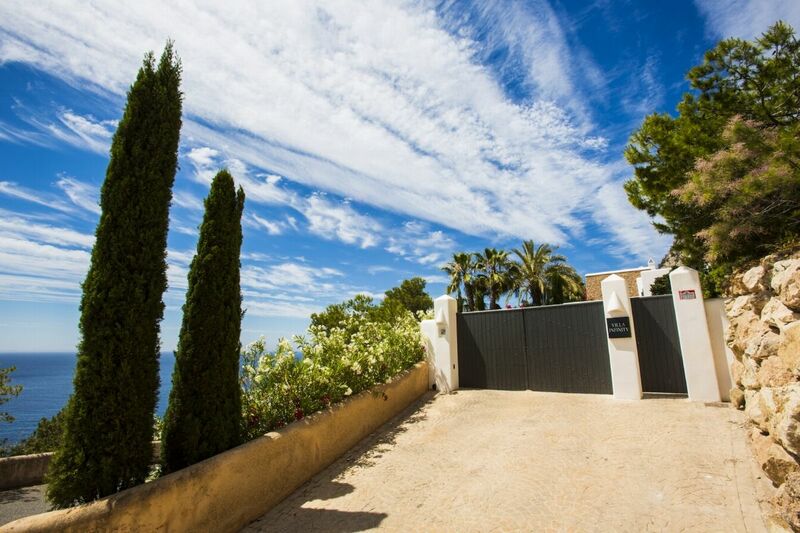 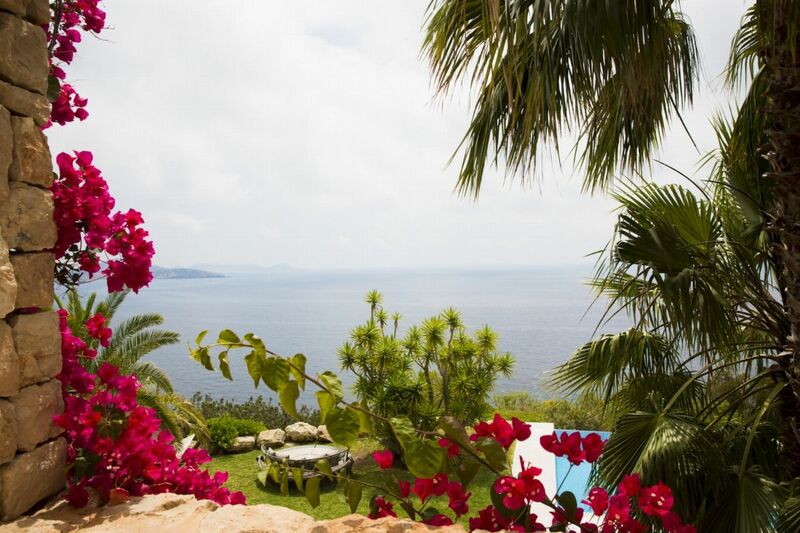 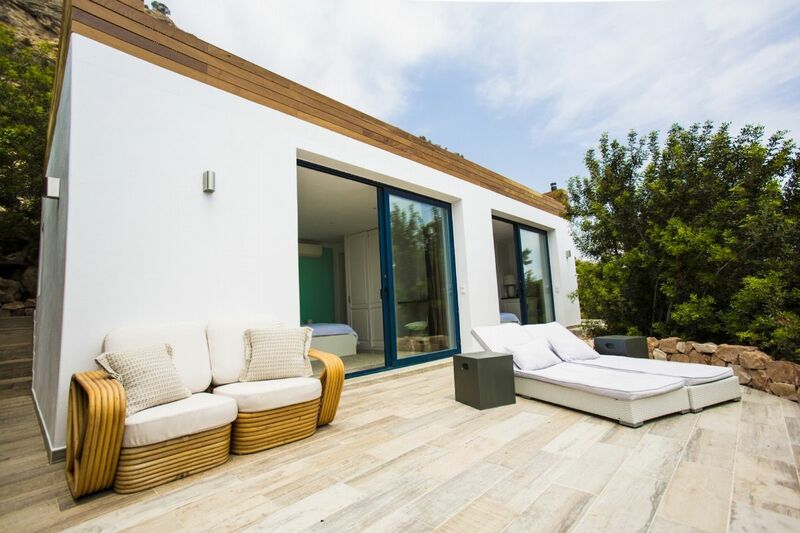 It has access onto the beautiful garden and has spectacular views to the Mediterranean sea. 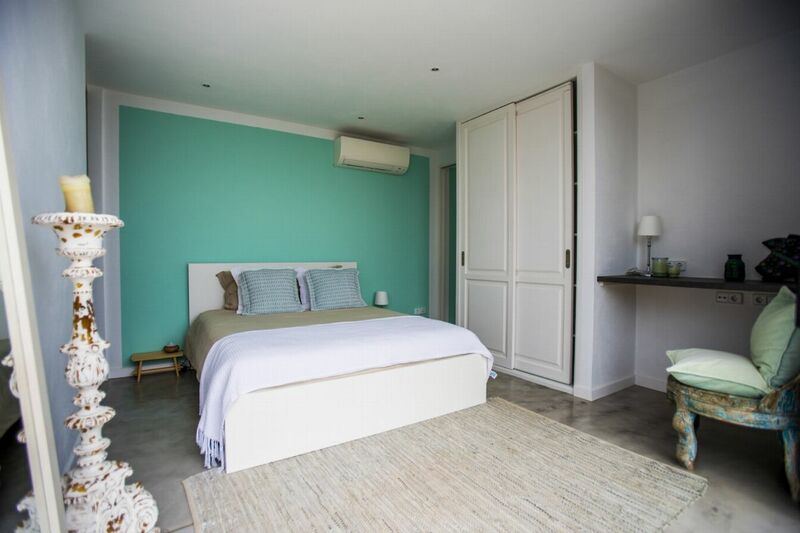 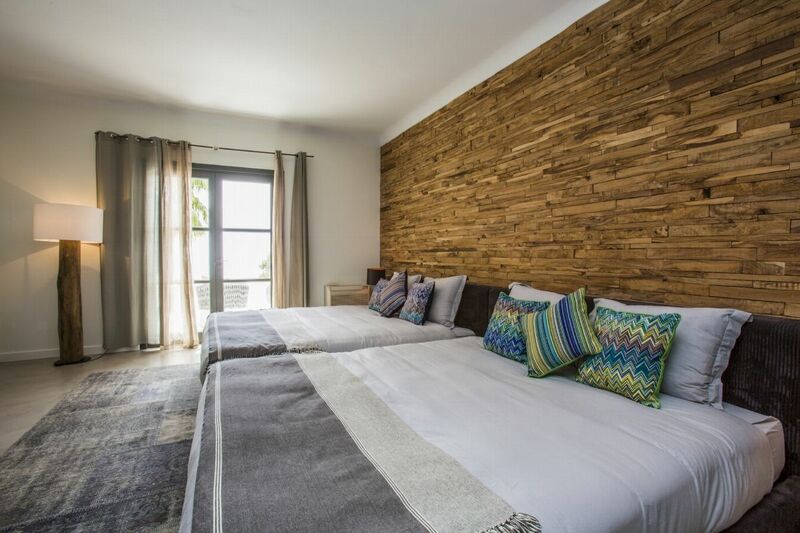 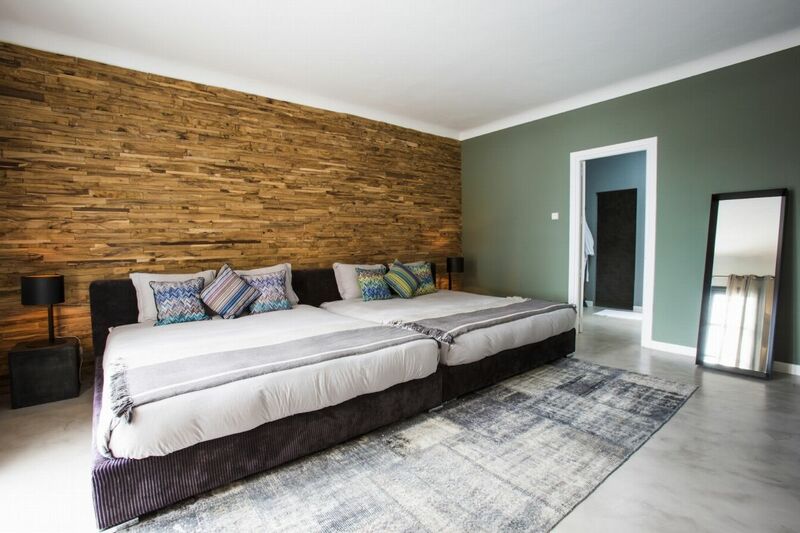 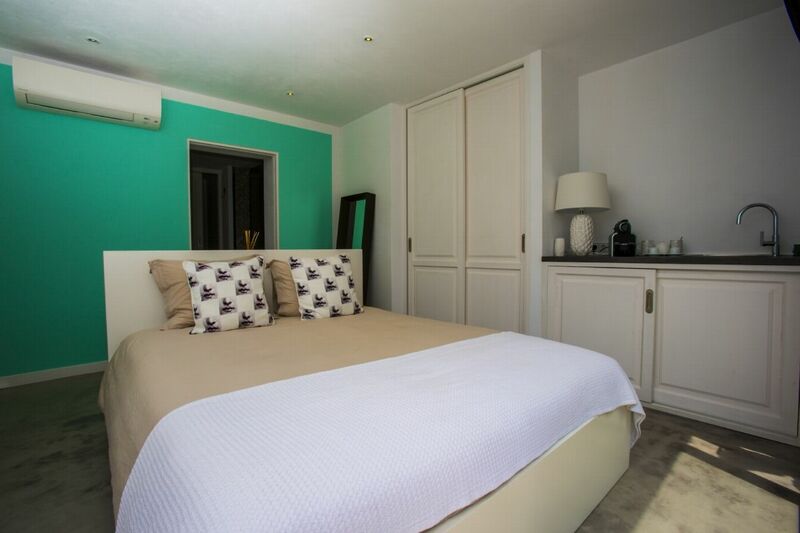 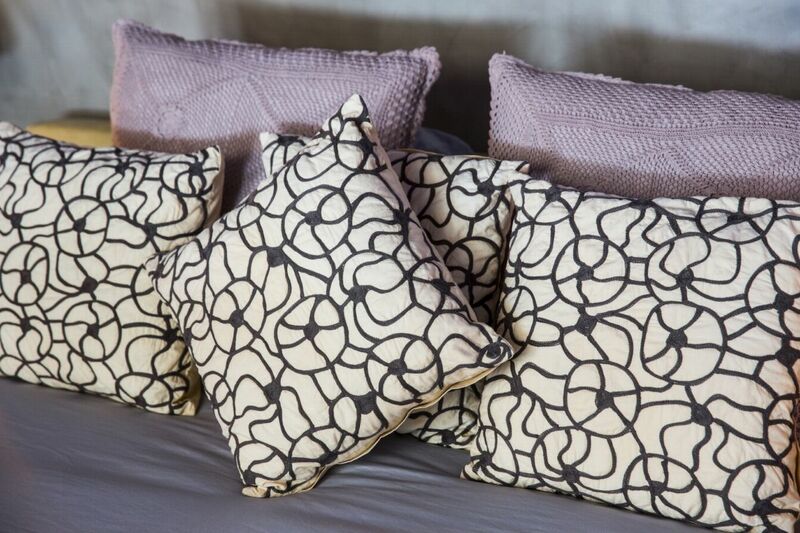 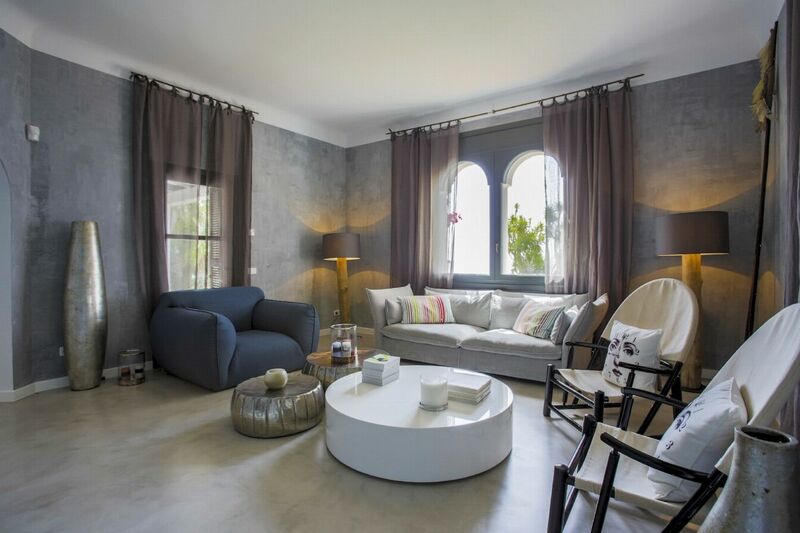 3rd Suite - Elegant and spacious double room measuring 50 square m2, brightly lit and with a stylish interior design with the very best of Spanish luxury. 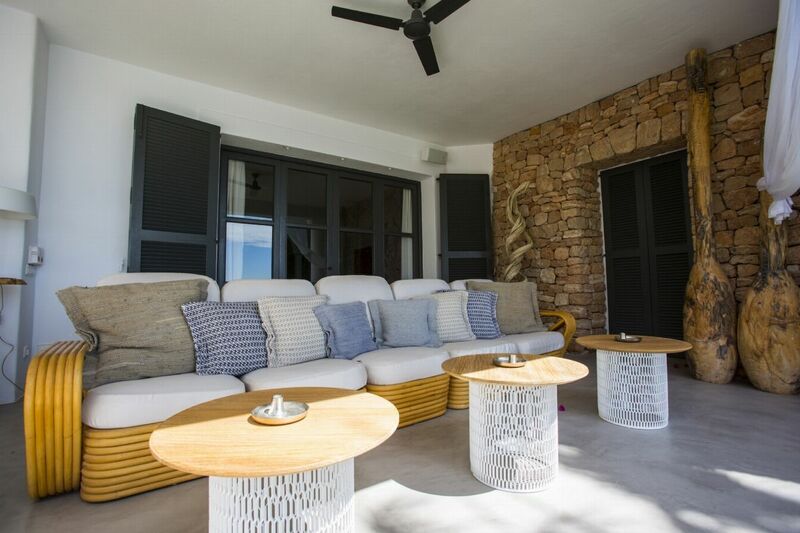 Located on the first floor of the villa, which allows to enjoy the direct access to the spectacular outdoor terrace with sun beds. 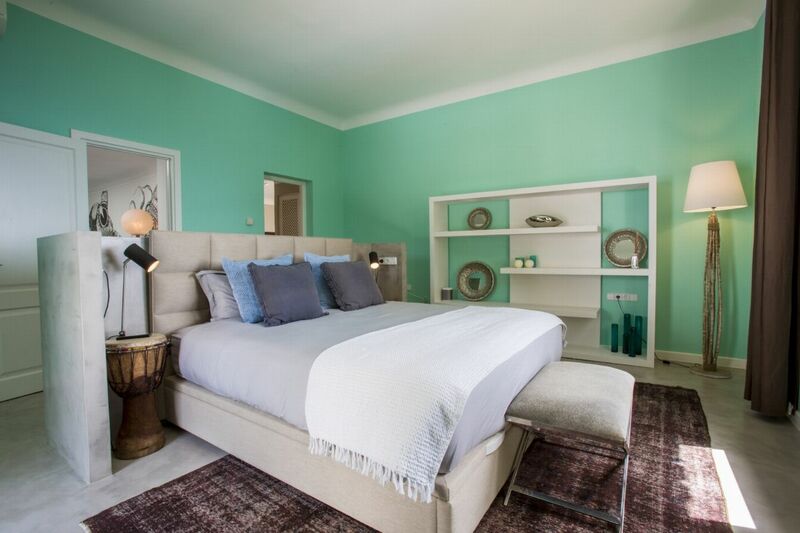 4th Suite - This is a modern and bright room, measuring 50 m2 and boasts two king size beds. 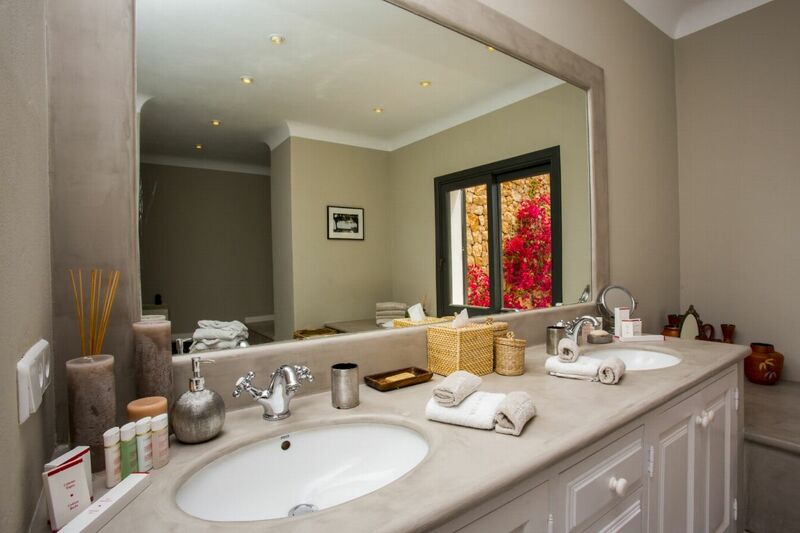 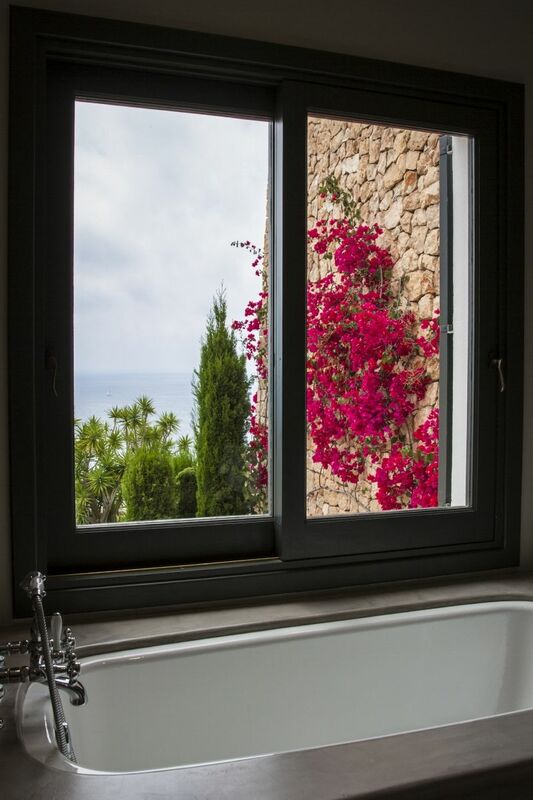 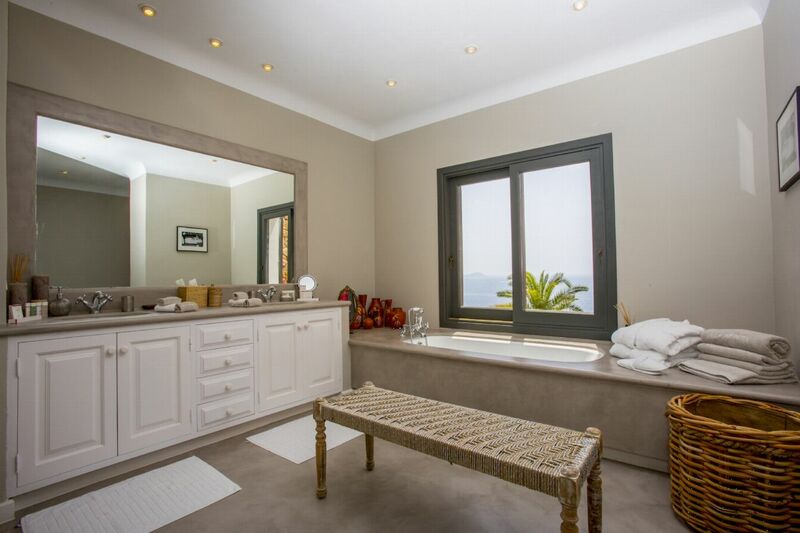 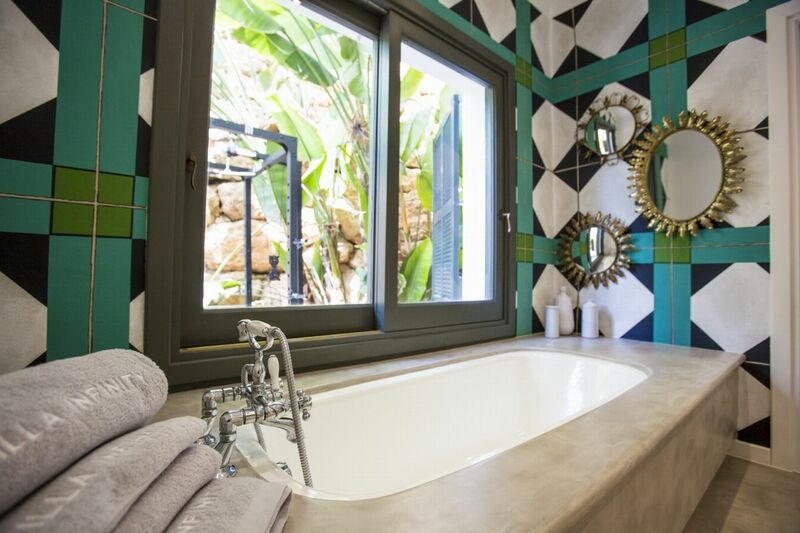 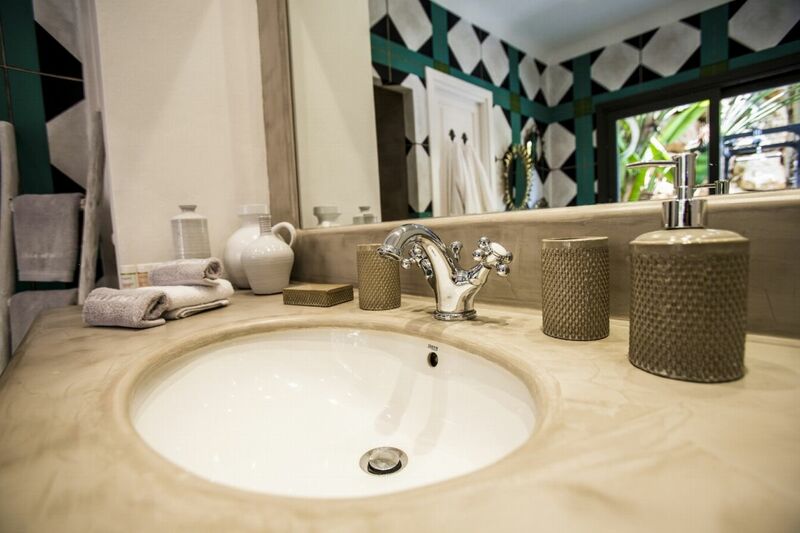 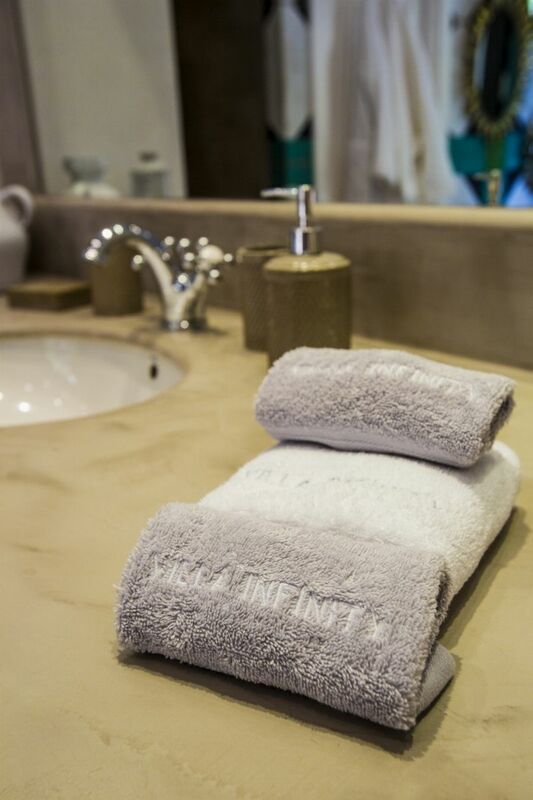 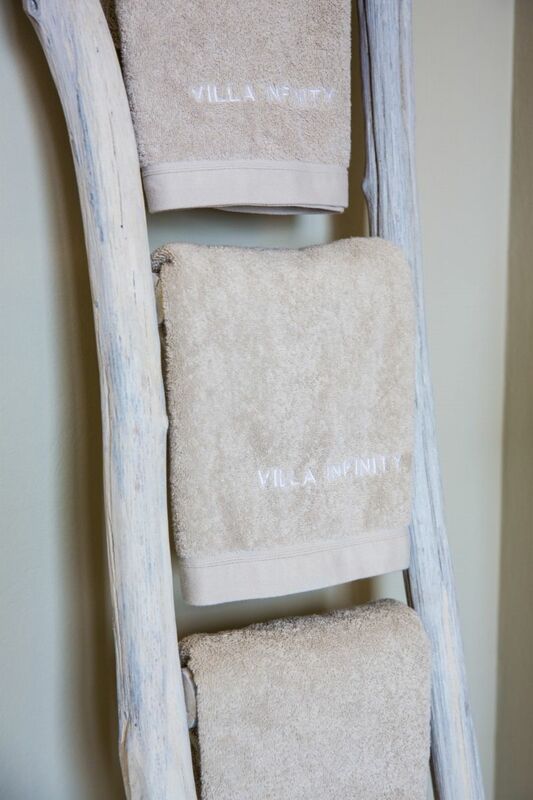 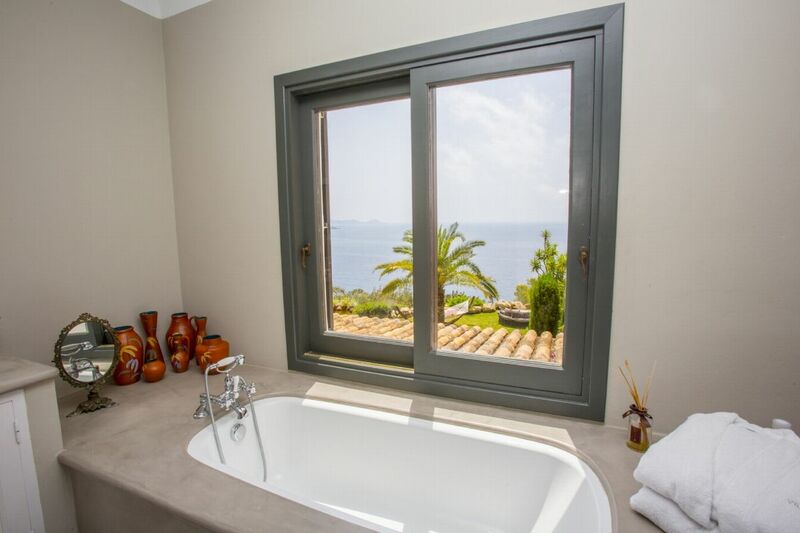 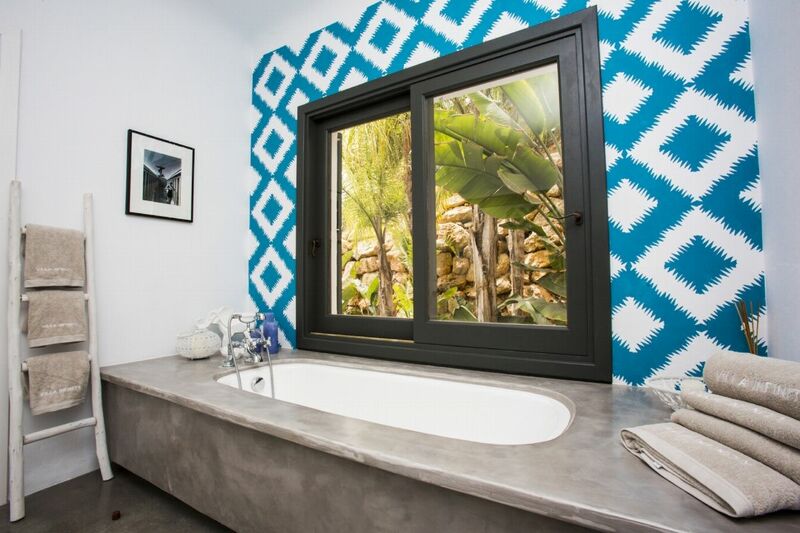 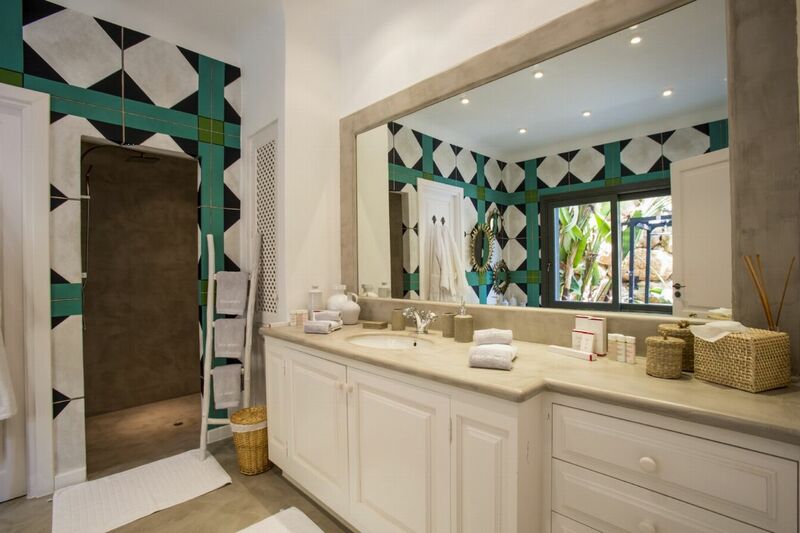 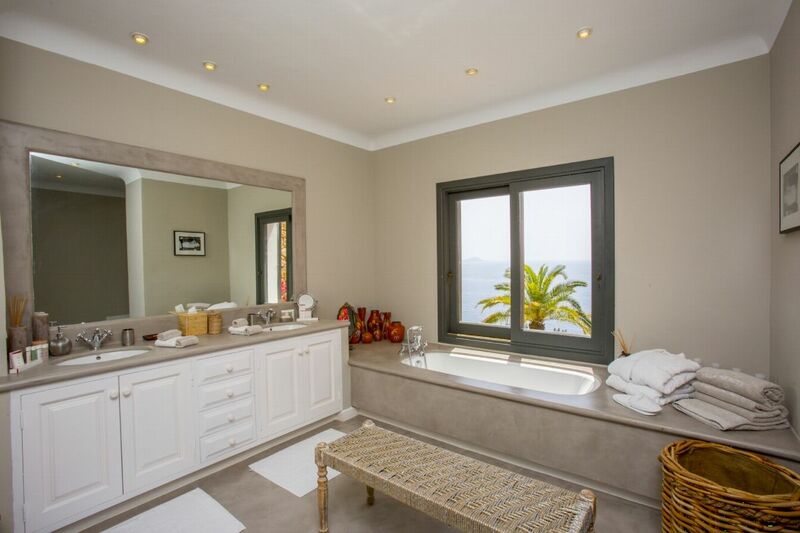 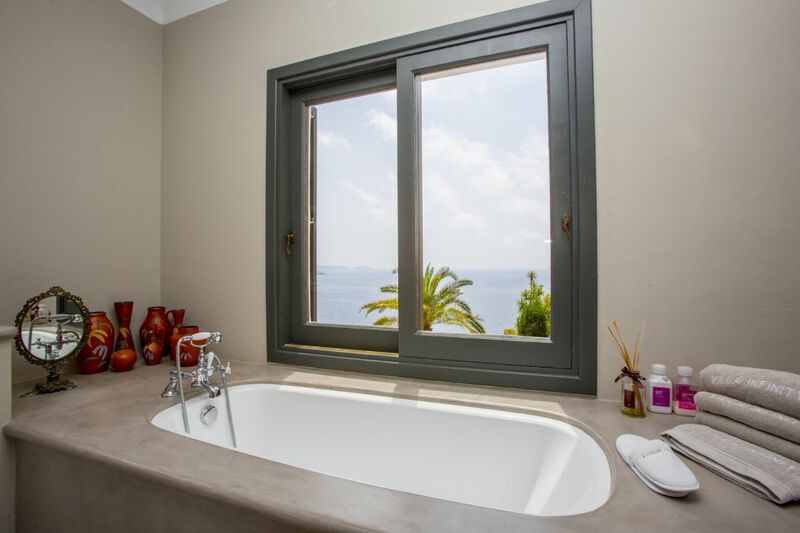 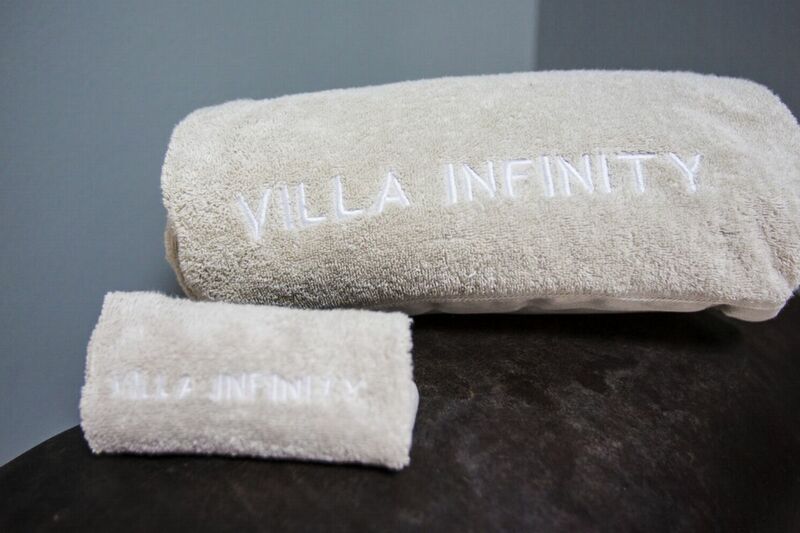 Located on the first floor of the villa and with direct access to the beautiful terrace, it is ideal for families with a modern en-suite bathroom with a rain shower. 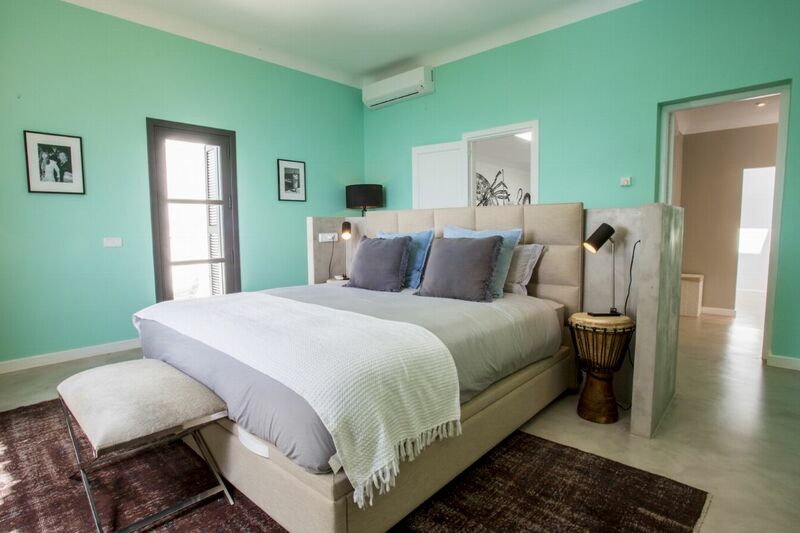 Double bedroom measuring 50 m2 designed to offer a unique experience. 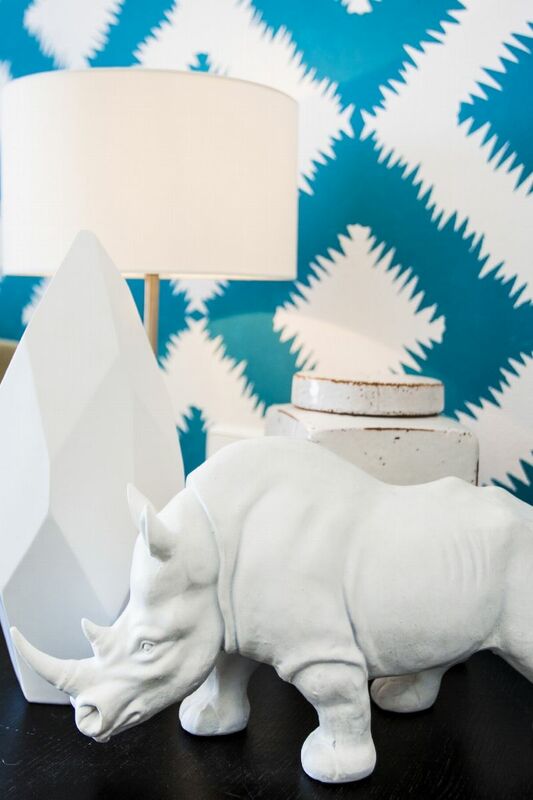 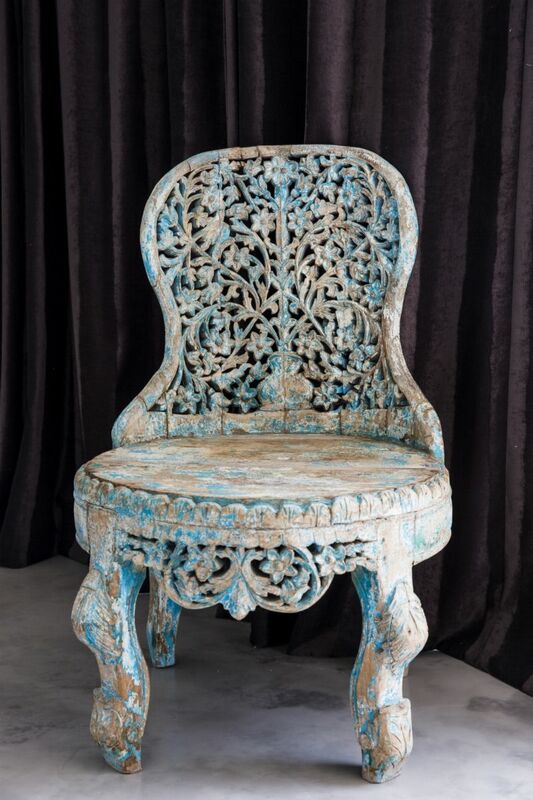 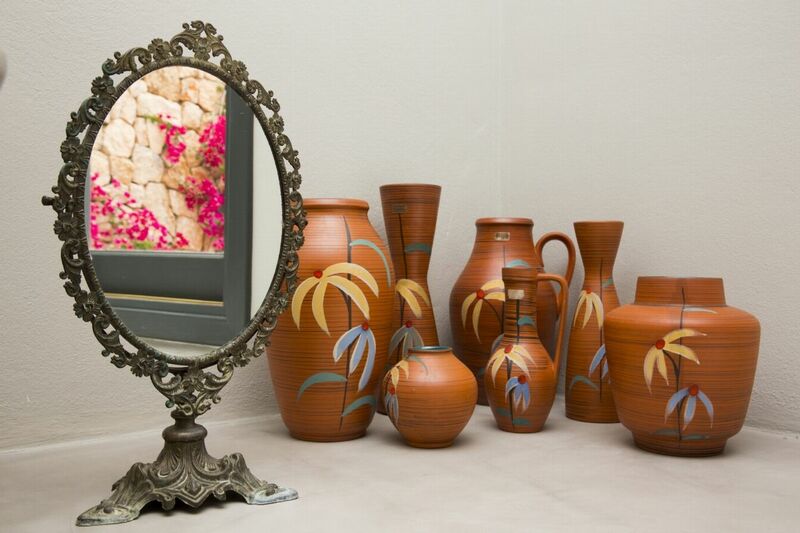 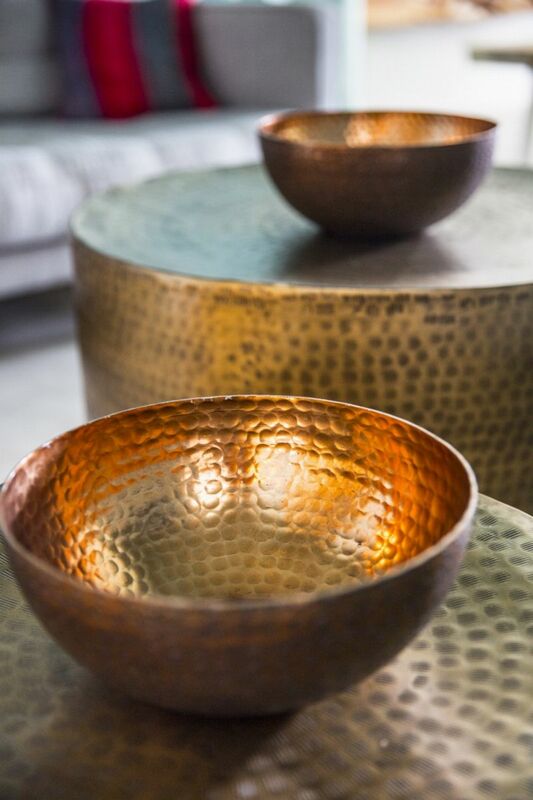 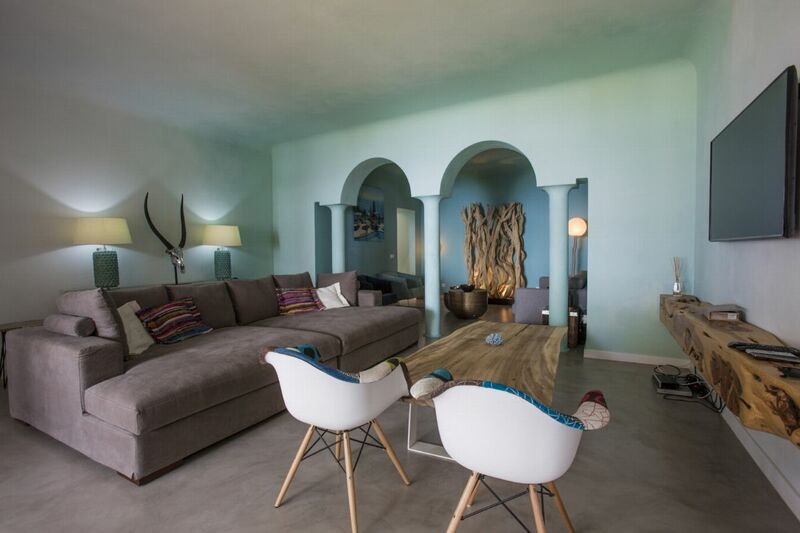 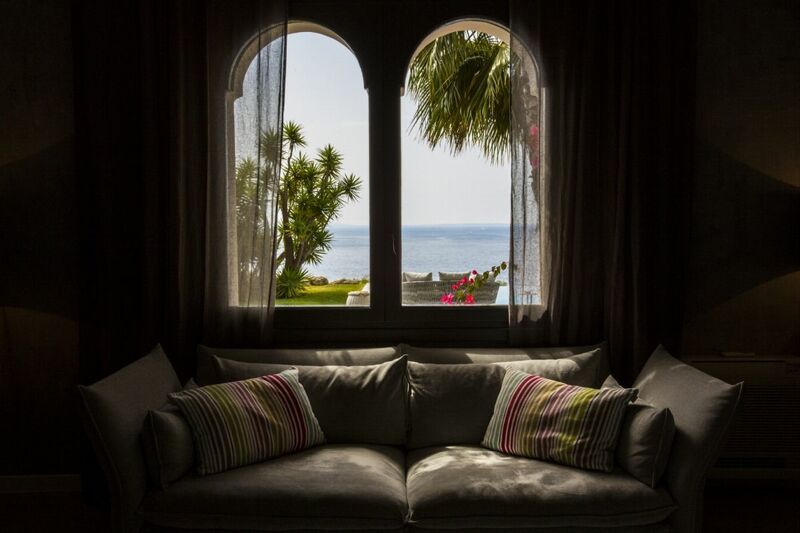 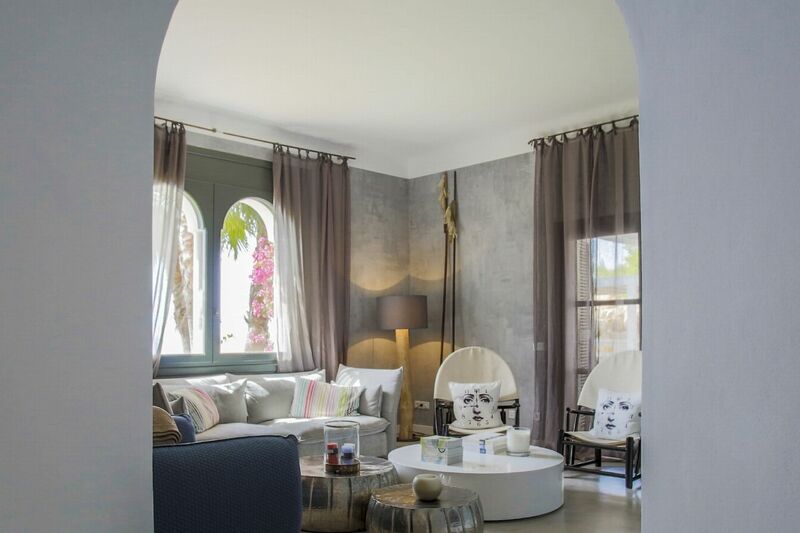 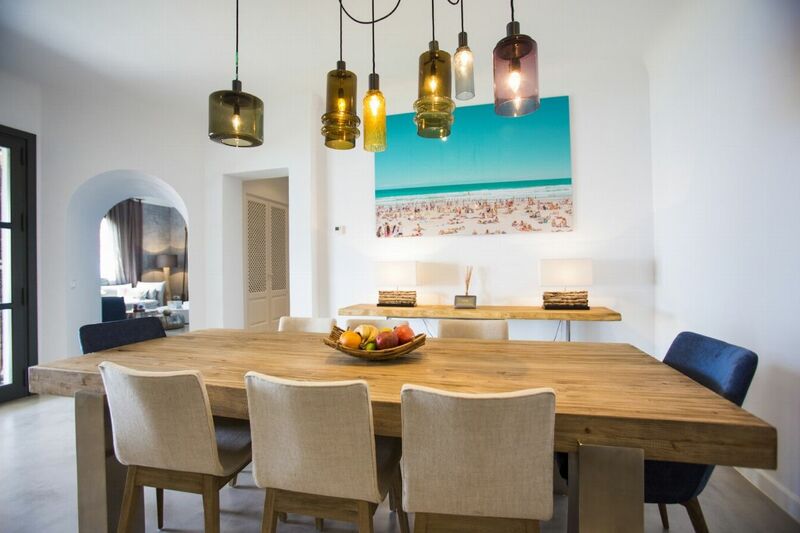 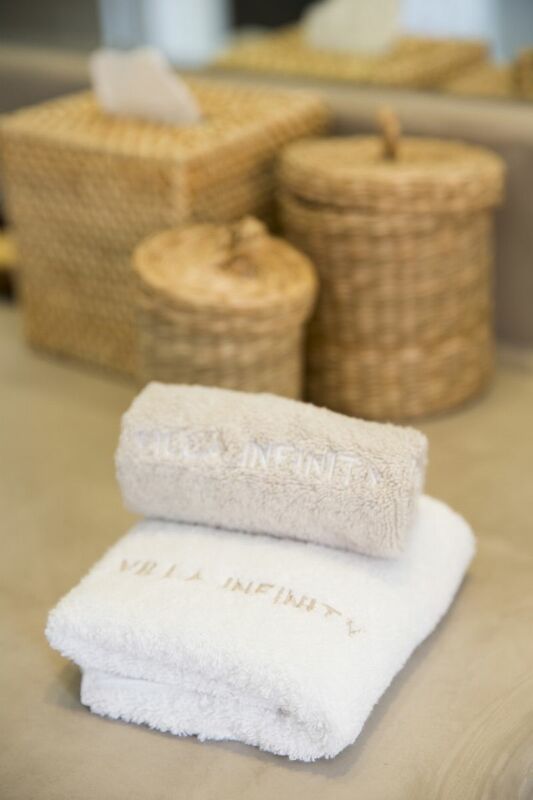 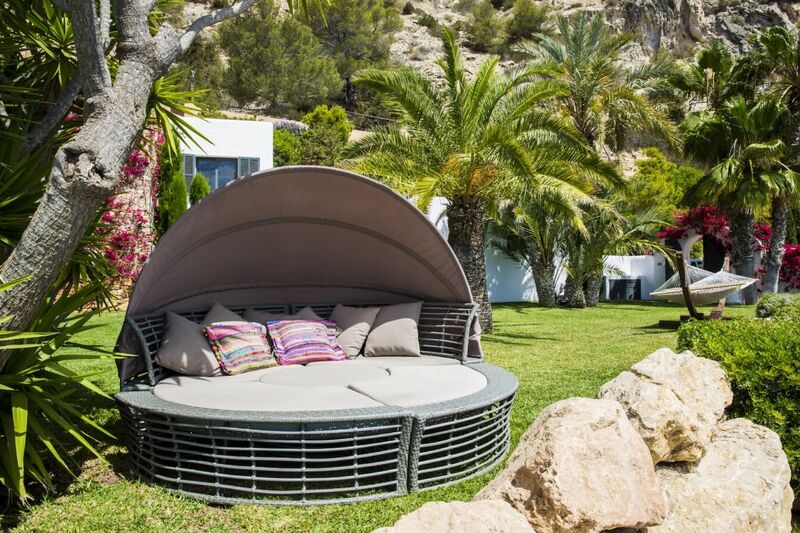 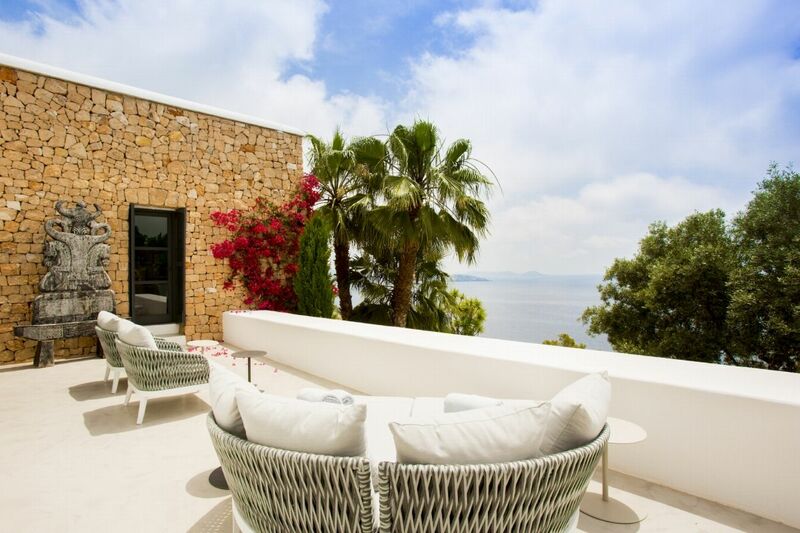 Located on the lower floor of the villa with direct access to a private outdoor terrace with sun beds.